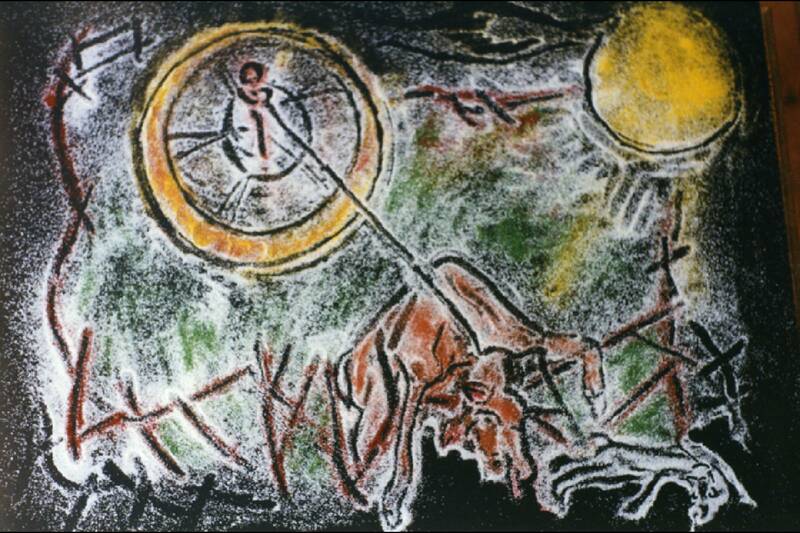 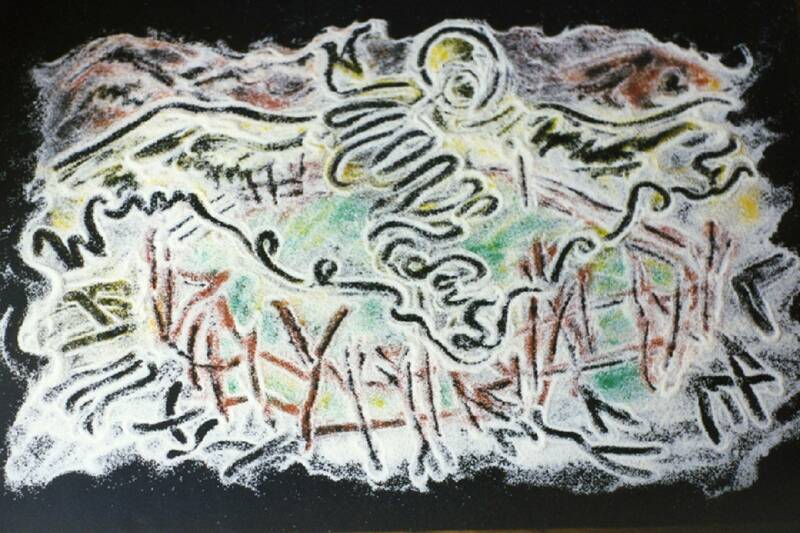 Ms. Rogers’ original design for the CHOEPHORAE sand painting was created while in residence at Artist Alliance, Inc. in New York City, & at the Anotati Scholi Kalon Technon in Athens, Greece, spring 2006. Created as a site-specific installation for a theatrical production, CHOEPHORAE – The Making of the Sand Painting documents the making of a large-scale sand portrait of Agamemnon. 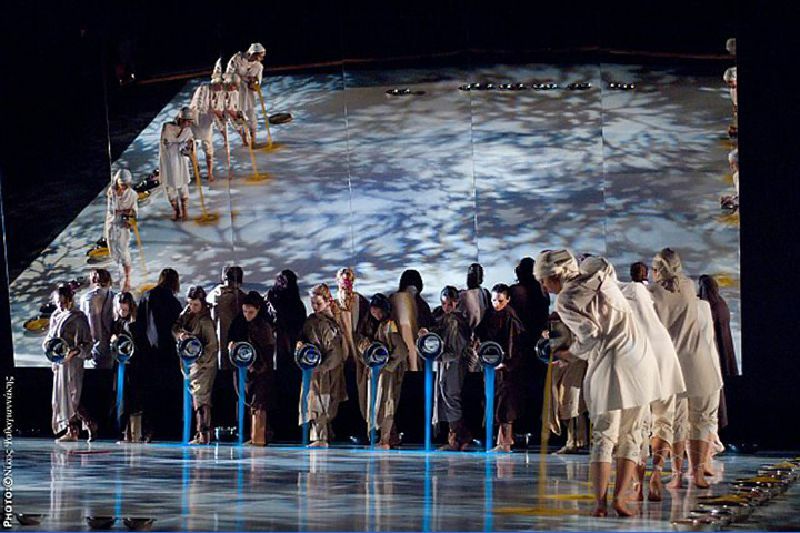 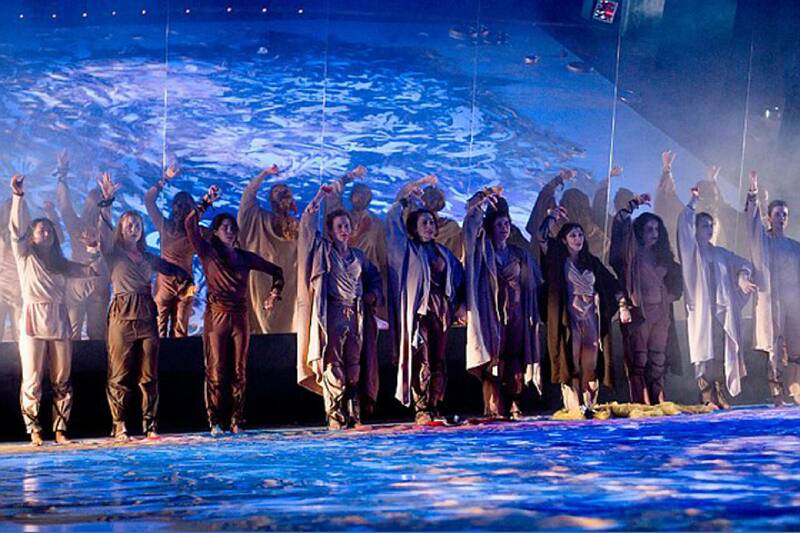 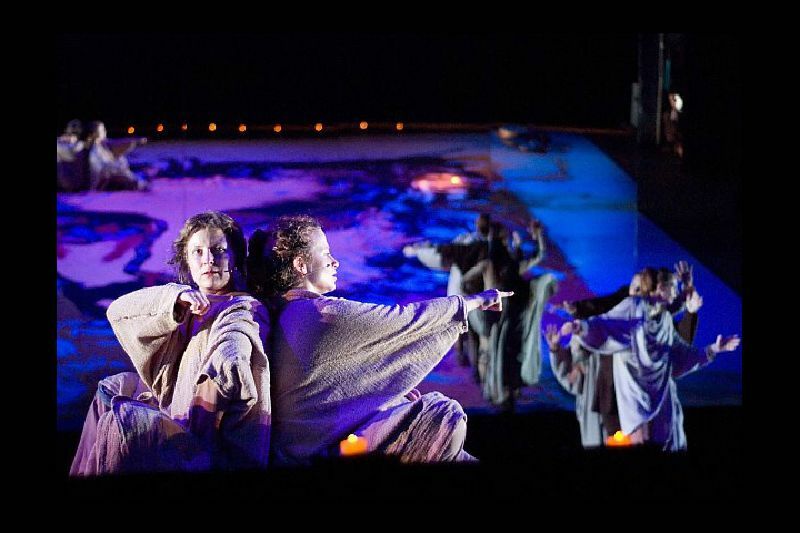 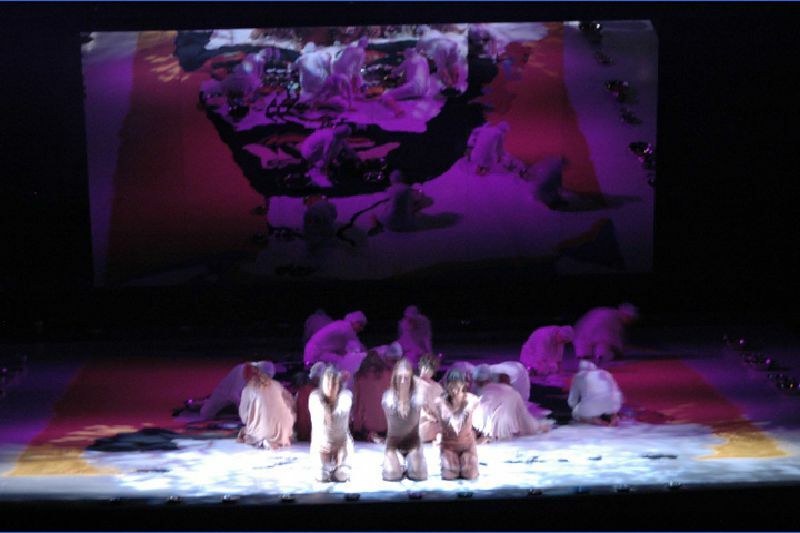 The play, a modern production of Aeschylus’ The Libation Bearers, (“Choephorae” in ancient Greek), is an international collaboration between a U.S and Greek company, which opened the Patras Festival in Patras, Greece, the Cultural Capital of Europe for 2006. 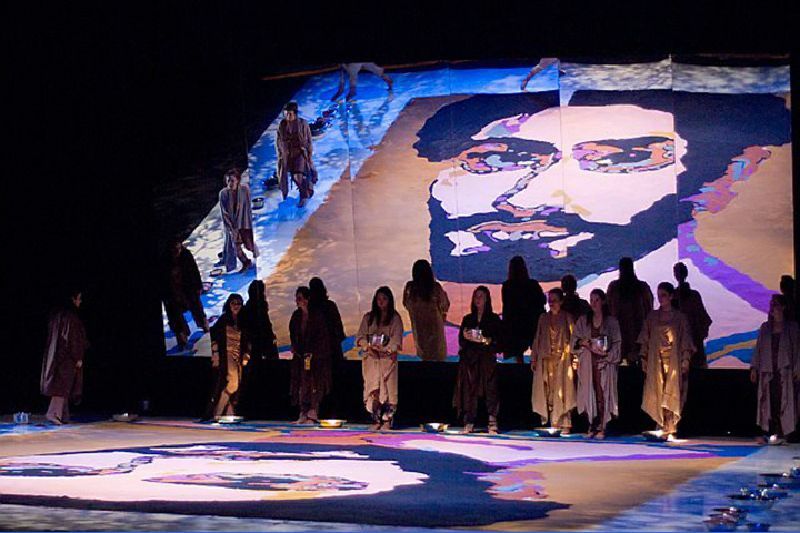 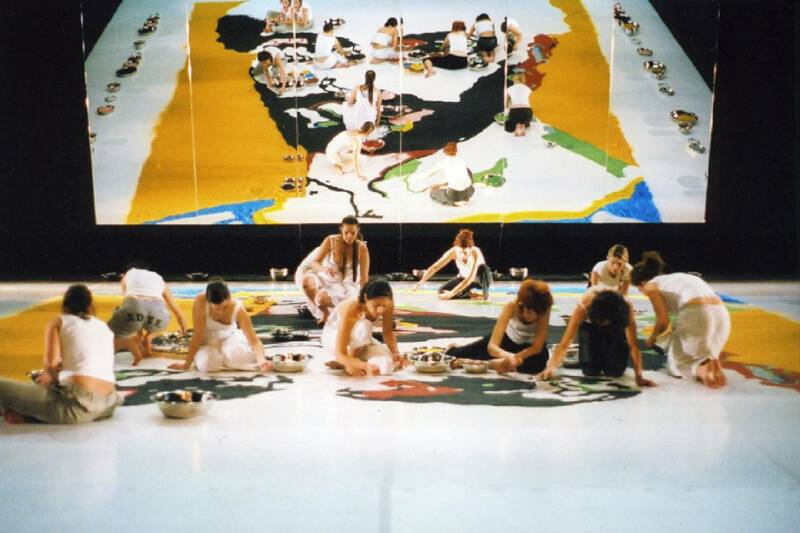 Commissioned as the set designer for the all female production, Ms. Rogers’ design incorporated a sand painting which filled the entire stage at 32 ft x 24 ft and required 700 lbs of sand per performance to complete. In addition, her set design included 6 mirrors, each 12 ft x 4 ft, hung together as one huge mirror at the back of the stage so the painting could be viewed from two planes. 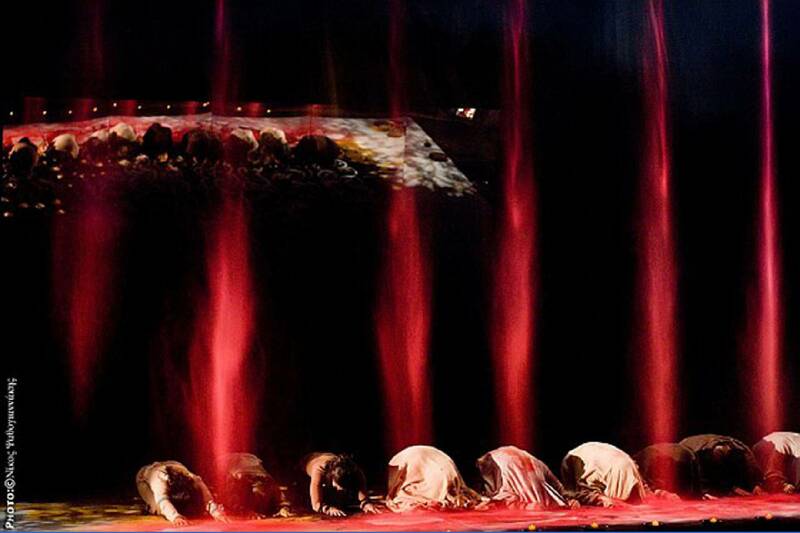 In CHOEPHORAE, the funeral act of pouring libations, historically enacted by slaves forced into ritual mourning for their master, is recast as a ritual act of art making, completed in real time in order to raise the spirit of the dead King. 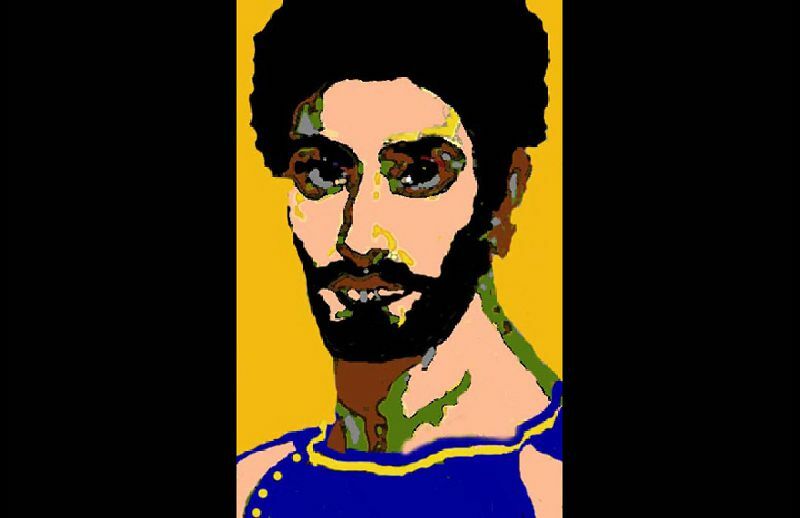 The painting, a collaboration between Ms. Rogers and a female team of 12 Greek visual artists*, was recreated each night during the play’s first act by the Greek painters in performance and then systematically destroyed by the Greek actors throughout the play’s second act. 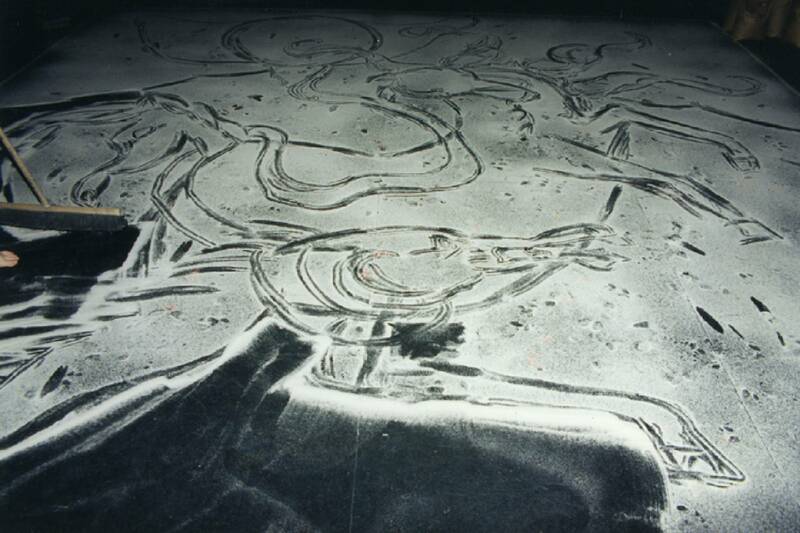 A time-based artist, Jenny approaches works in sand the same way she approaches her film, video and theatrical work. 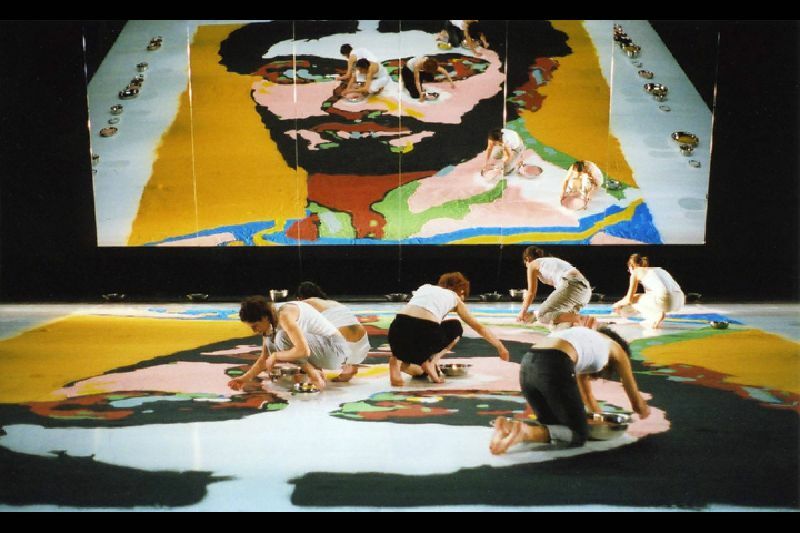 All are installations in time and space, whether her medium is a grain of sand, a grain of film or a pixel of video. 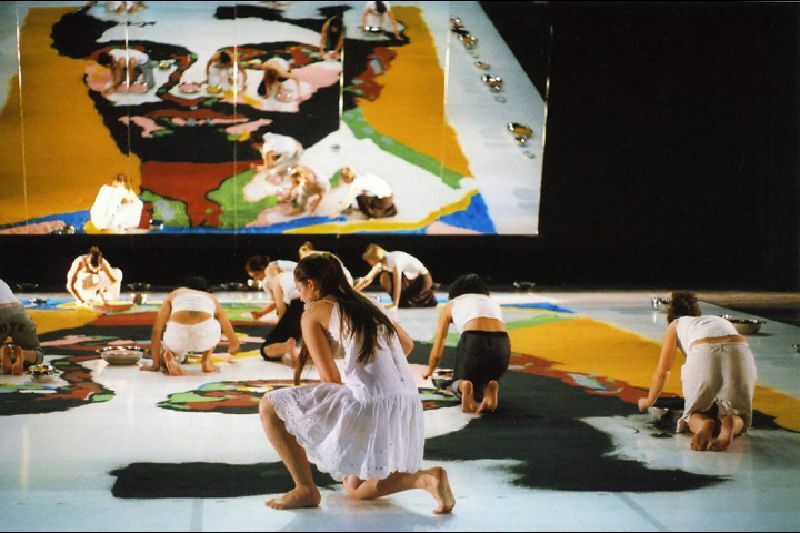 All are located at the intersection between art making and the performance of community, where at inception and reception both depend on ritual activities to give them life. 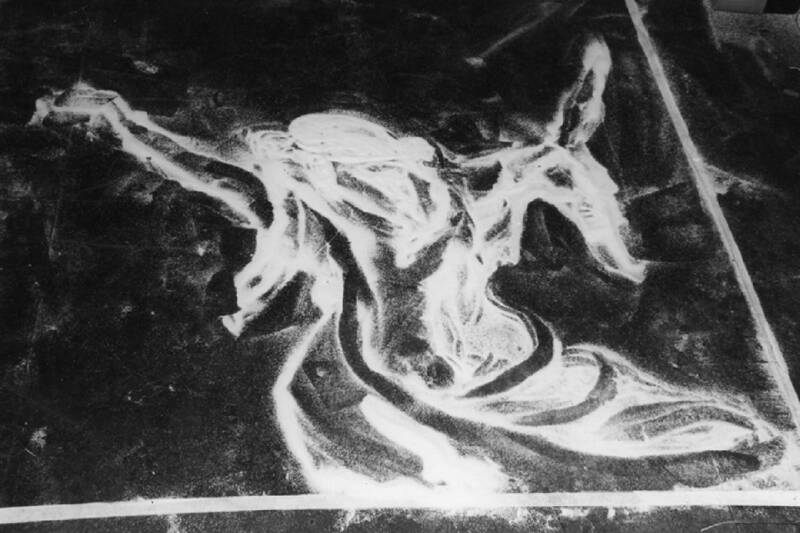 Experimental filmmaker Maya Deren, defined ritual as “an action distinguished from all others in that it seeks the realization of its purpose through the exercise of form.” Ms. Rogers’ sand paintings seek to articulate their metaphors through the method and form of their creation. 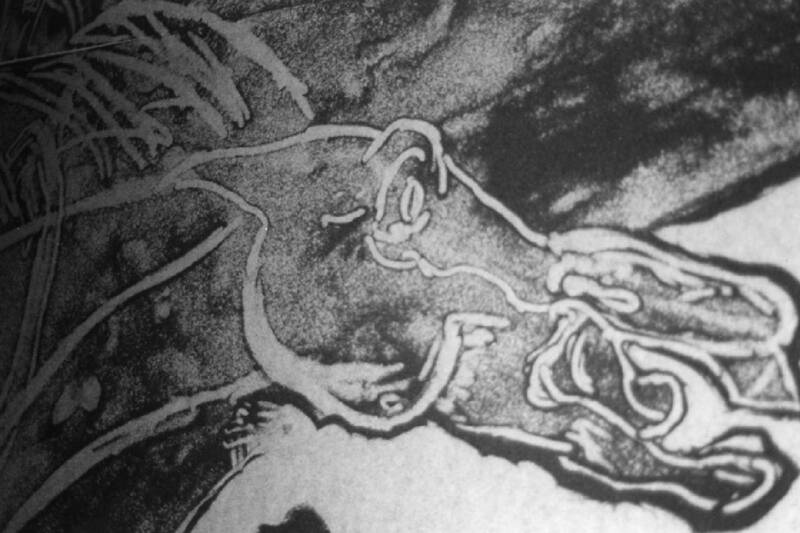 Specifically found in ceremonial sand paintings, mark making in the earth here sanctifies space giving it theatrical life. 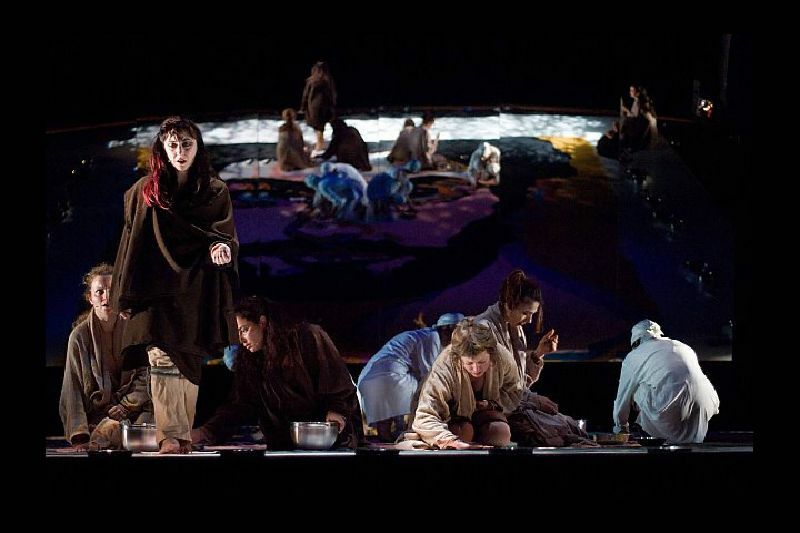 The play, CHOEPHORAE, a modern production of Aeschylus’ The Libation Bearers, (“Choephorae” in ancient Greek), features an all female cast, playing male & female roles throughout the play, in an international collaboration between a U.S and Greek company, which opened the Patras Festival in Patras, Greece, the Cultural Capital of Europe for 2006. 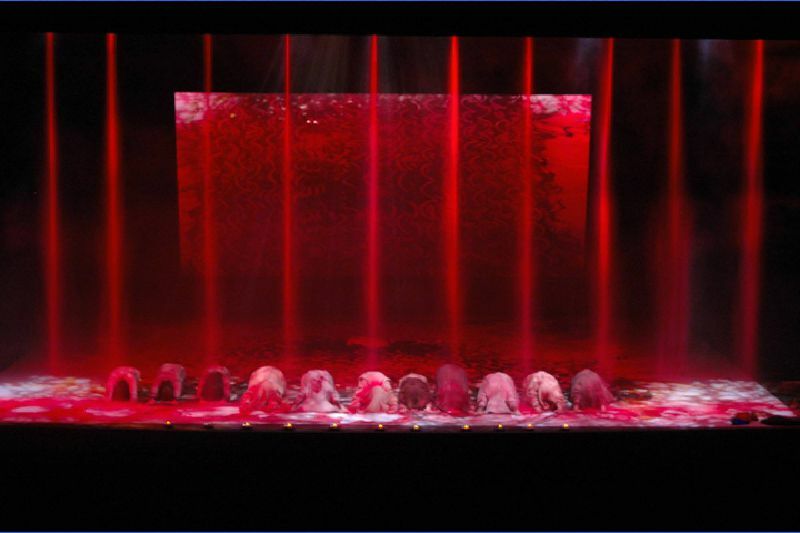 In CHOEPHORAE, the funeral act of pouring libations, historically enacted by slaves, or holferes, (which literally means slave or earth in Ancient Greek) forced into ritual mourning for their master, is recast as a ritual act of art making. 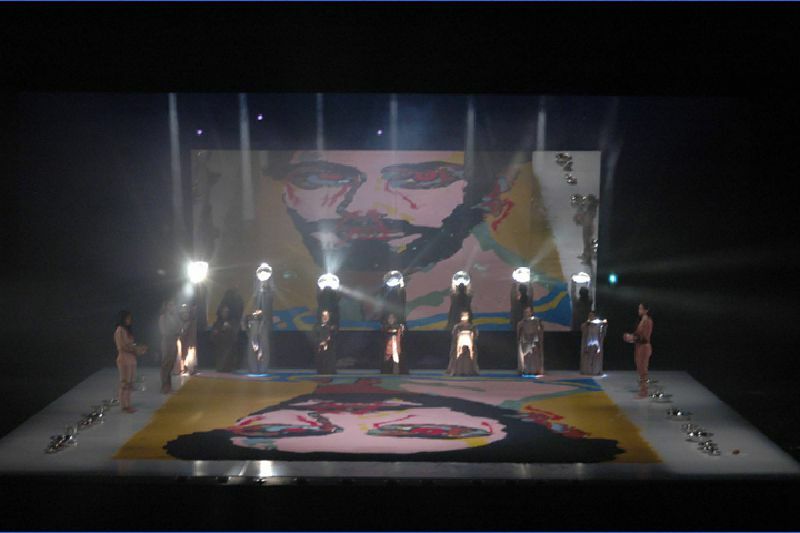 Completed in real time, the pouring of libation, here the pouring of sand, culminates in the creation of a portrait of Agamemnon, a vision called forth in order to raise the spirit of the dead King. 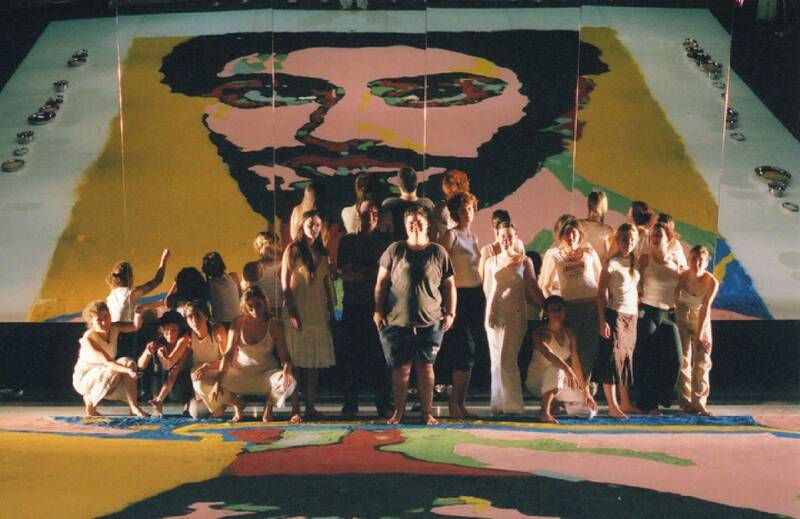 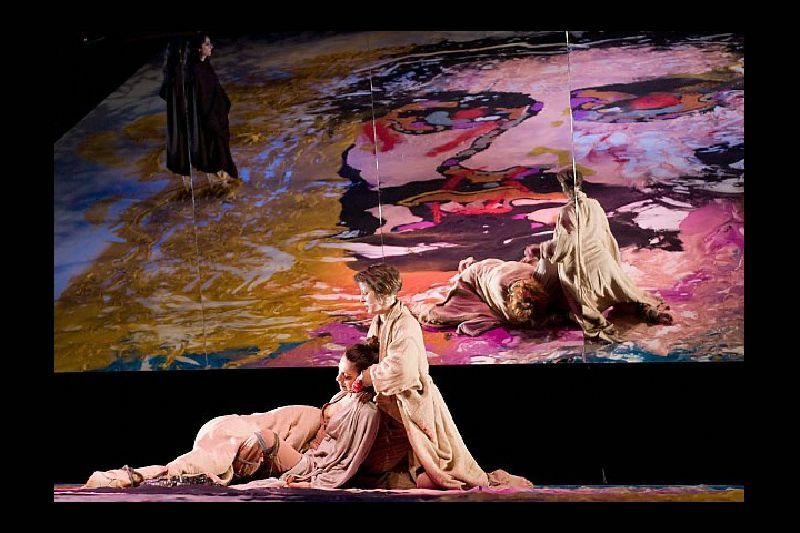 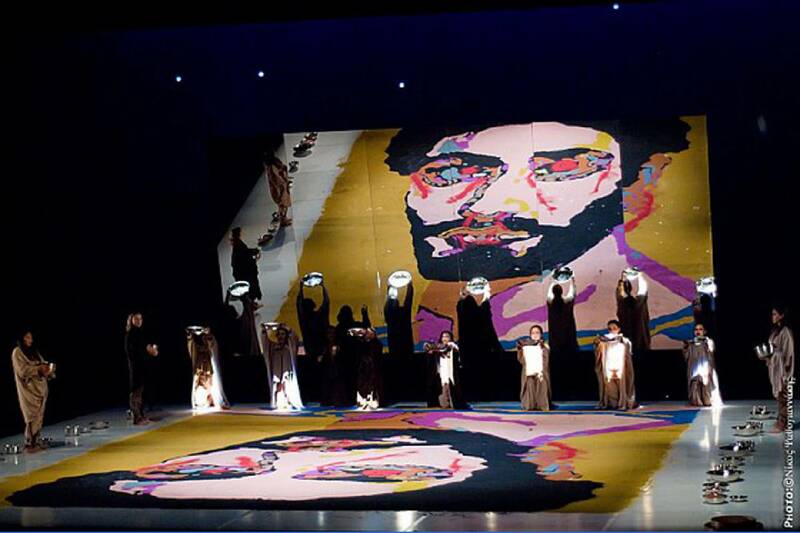 The painting, a collaboration between Ms. Rogers and a female team of 12 Greek visual artists, was recreated each night during the play’s first act by the Greek painters, cast as mourners, during the performance of the play. 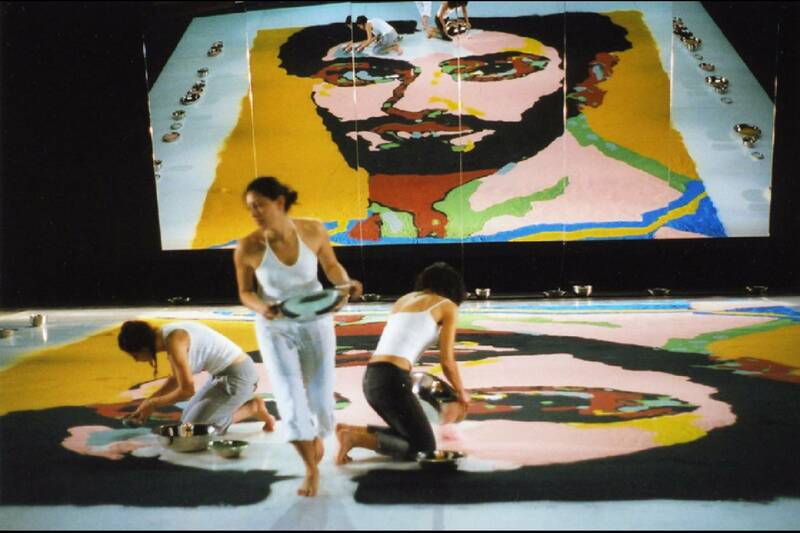 The painting is later systematically destroyed by the Greek actresses in the production’s second act. 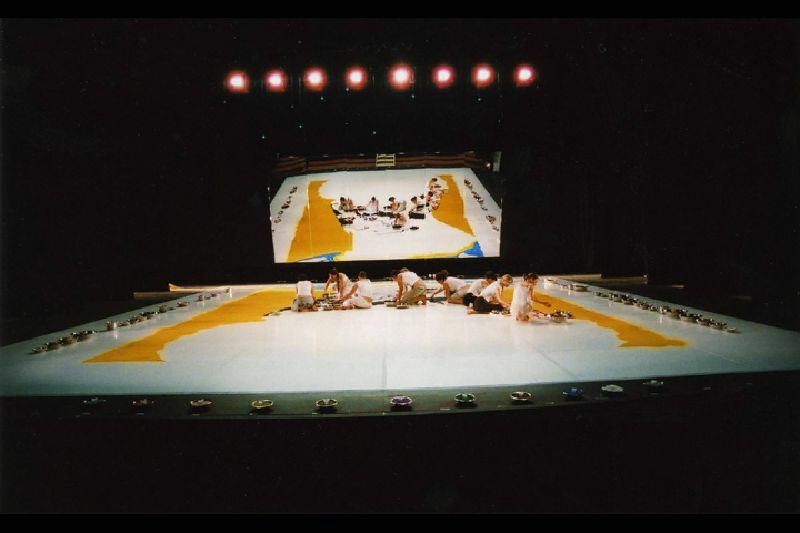 Commissioned as the set designer for the all female production, Ms. Rogers’ design required 700 lbs of sand per performance to complete a sand painting which filled the entire stage --32 ft x 24 ft . 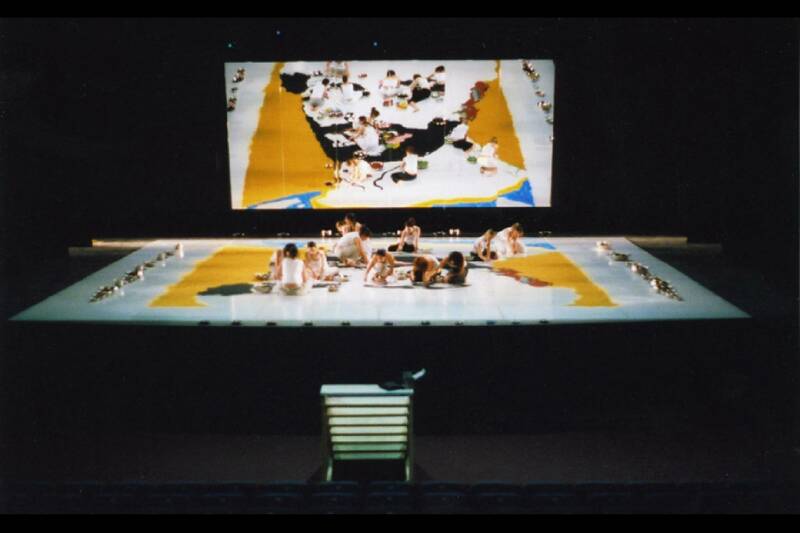 In addition, her set design included 6 mirrors, (each 12 ft x 4 ft), hung together as one huge mirror at the back of the stage so the painting could be viewed from two planes. 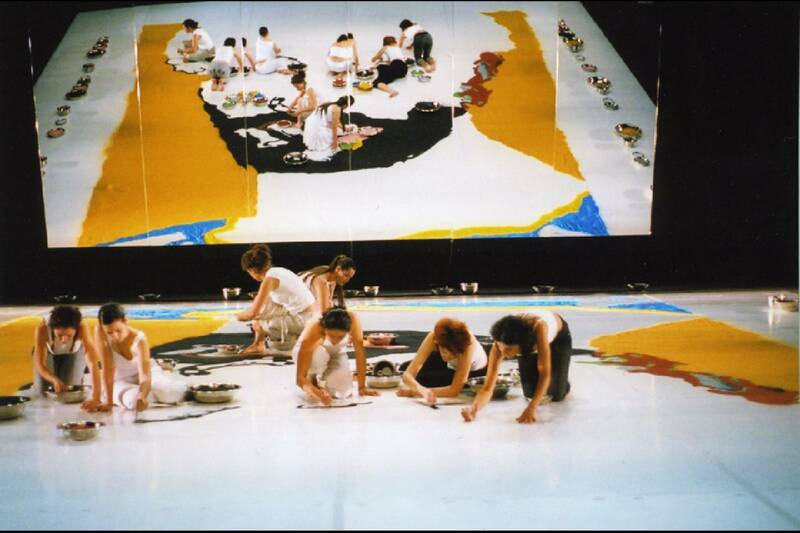 The careful and deliberate process of how the painting could be completed within the actual time period of the play without pulling focus from the play’s language and performance was developed over the course of a two month rehearsal residency with the painters and actresses in Athens. 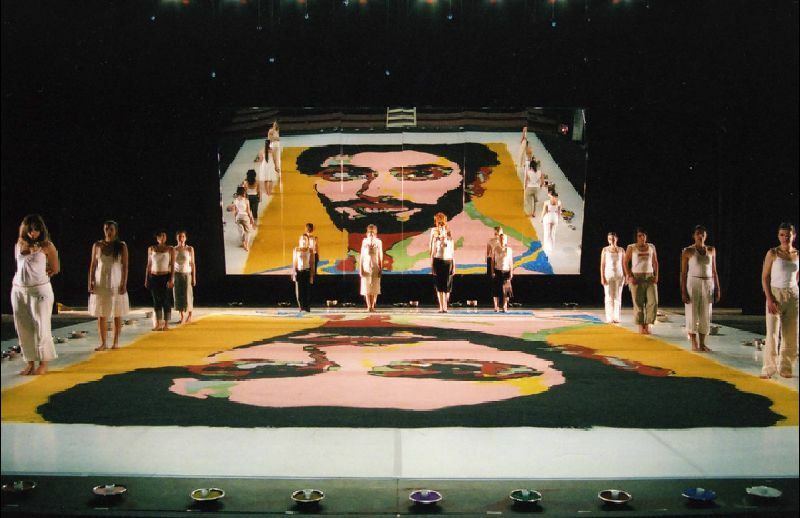 This complicated process of building the sand painting had to be competed within the forty-five minutes allotted to the play’s first act & had to cover the entire stage without the painters being “seen”. 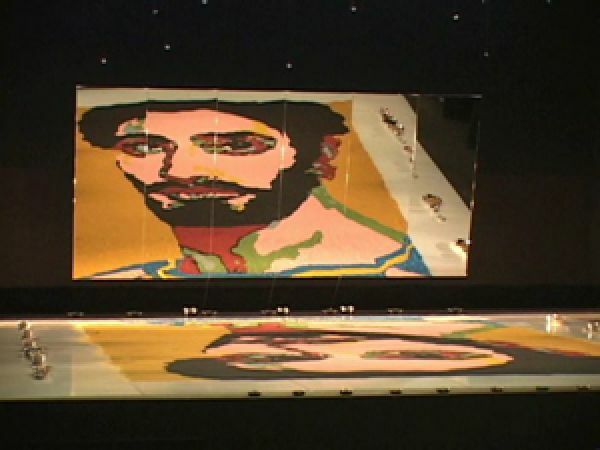 Created upside down on the stage so that it could be seen rightside up by the audience, it is not until the final moments of the first act, that the painting becomes recognizable as a portrait. 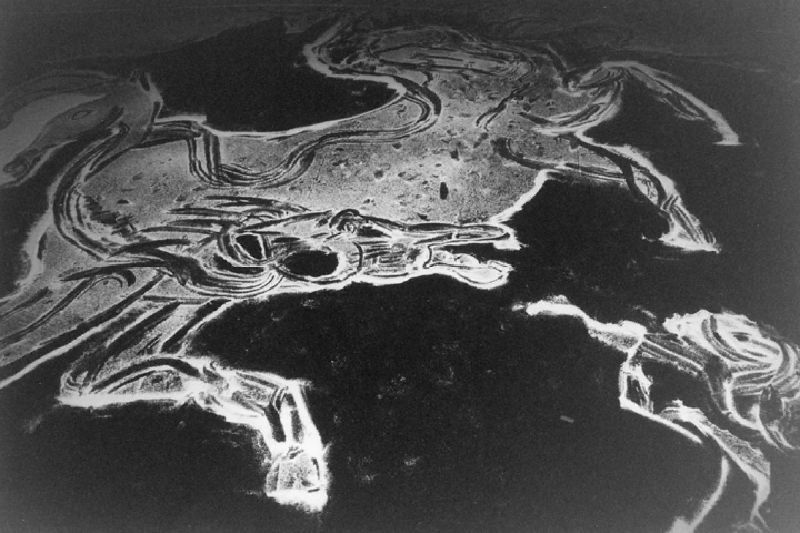 In addition, each section of the painting once completed, could not be walked on, thus removing another piece of play space and preserving the integrity of the image in sand until that moment of relevation when Agememnon’s spirit rises from the grave. 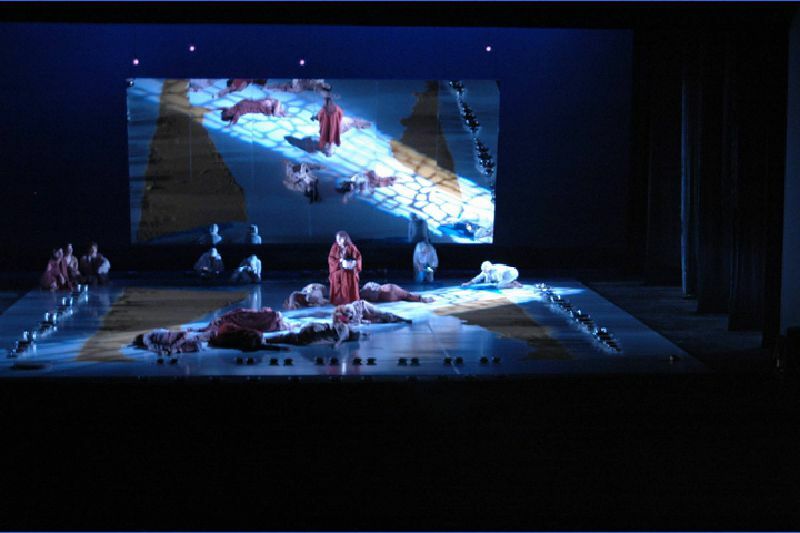 Adapted and directed by Lee Breuer, CHOEPHORAE, the second part of Aeschylus’ Oresteia, (& the only surviving trilogy of the ancient Greek plays), chronicles the aftermath of the death of Agememnon at the hands of his wife, Clytemnestra, & her lover, and the subsequent revenge plot taken by his children, Orestes and Electra, to avenge him-- a plot that ends Clytemnestra’s life and causes Orestes to go mad. 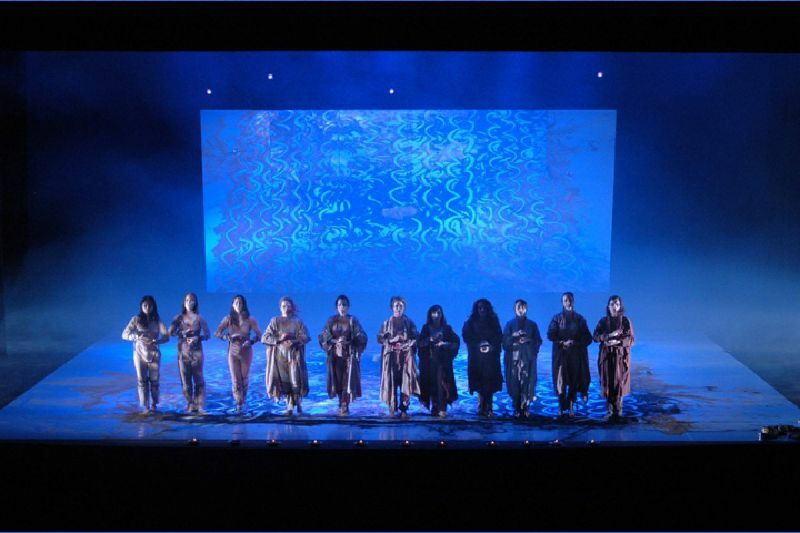 Staged as a choral work of "performance poetry," CHOEPHORAE fuses the elements of choreography, conceptual design, music, sound and an epic/lyric approach to acting. 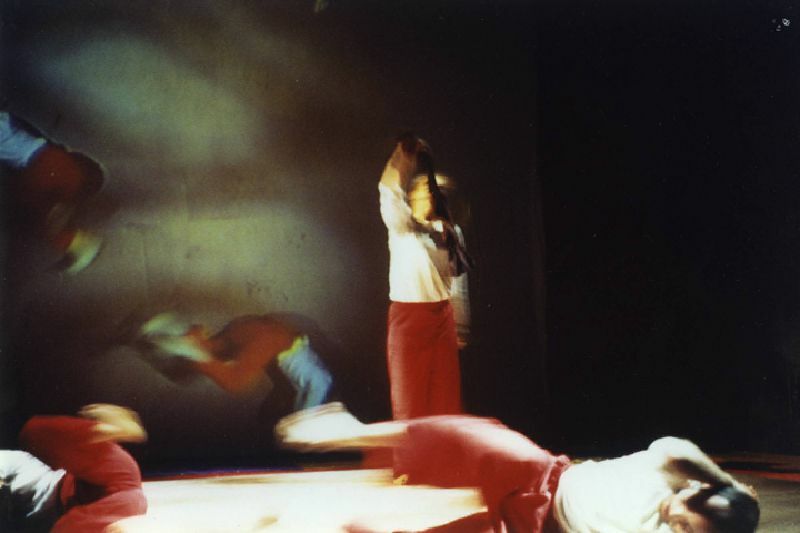 RED HORSE is an experimental theatrical production, conceived of on two planes, like the open pages of a comic book. Action takes place on the stage & on the projection screen hung at the back of the stage with an overhead camera capturing the movements of the actors. 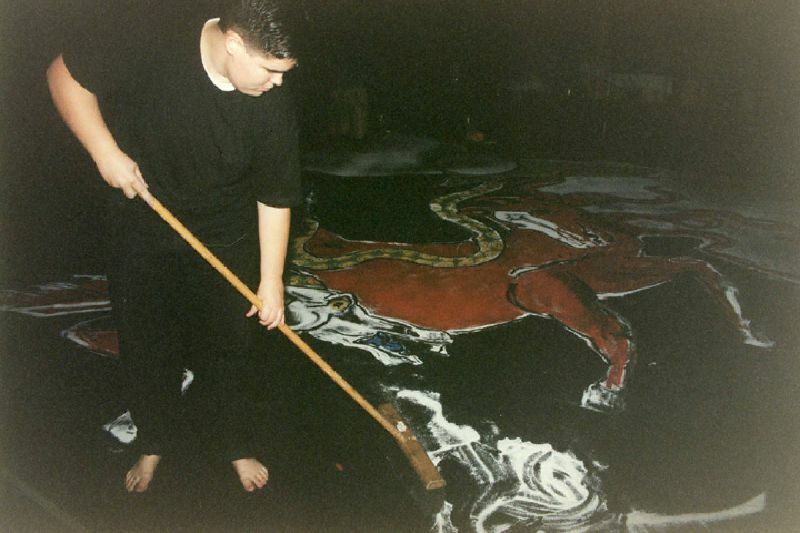 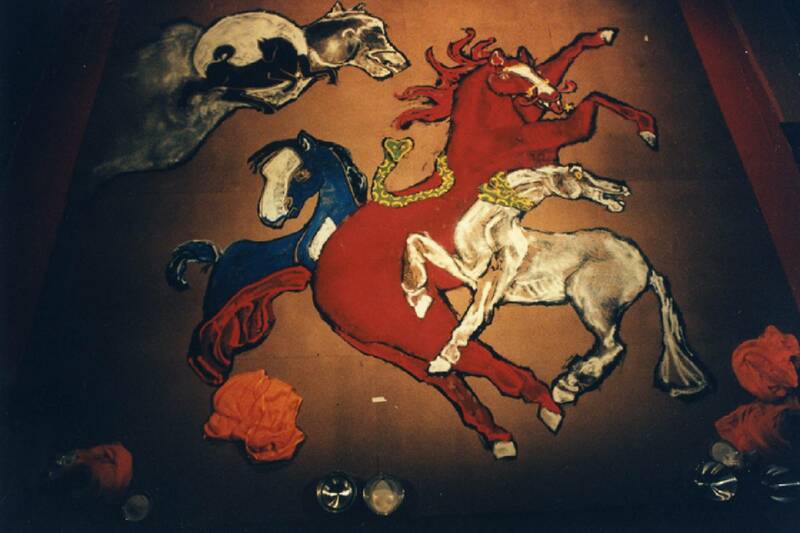 The entire stage floor is covered with a large-scale sand painting of the Red Horse that shifts and changes with each performer’s movements. 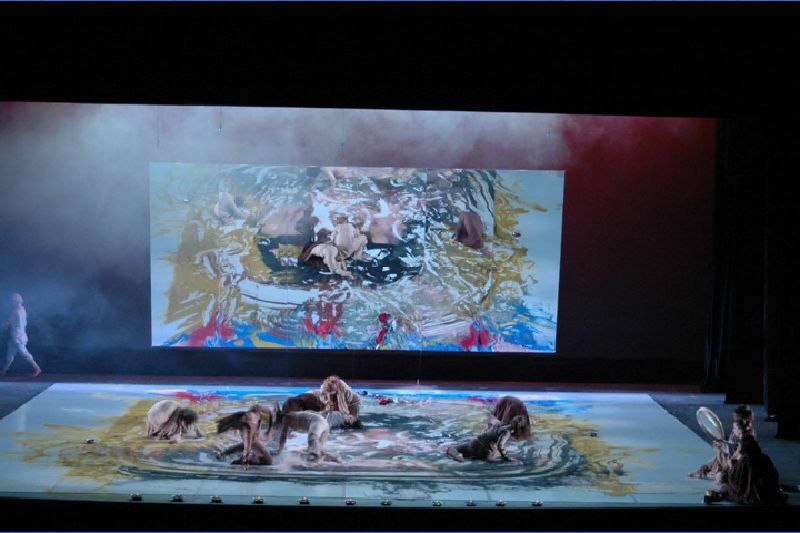 Throughout the performance, artist Jenny Rogers continues to paint with sand around and through the actors, creating the horse’s surroundings- the fence, the gorge, the field & the Gobi Desert. 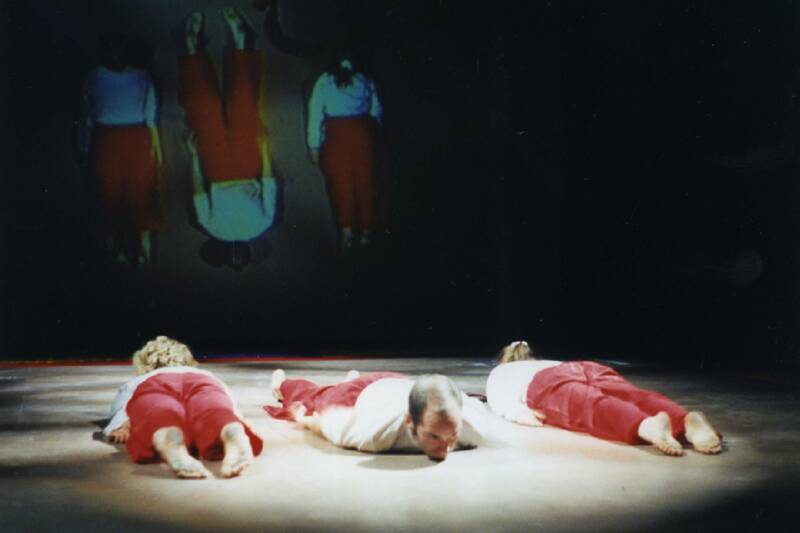 Performers lie together upon the stage floor creating slow motion shapes like the stop action frames of a horse galloping, linked together in jerky rhythms in an early Muybridge animal locomotion experiment. Because of the video projection of the play space, the audience is able to view the performance simultaneous from two angles. The play metaphorically depicts, through the life of a horse, the artists’ struggle to make a piece of collaborative work. 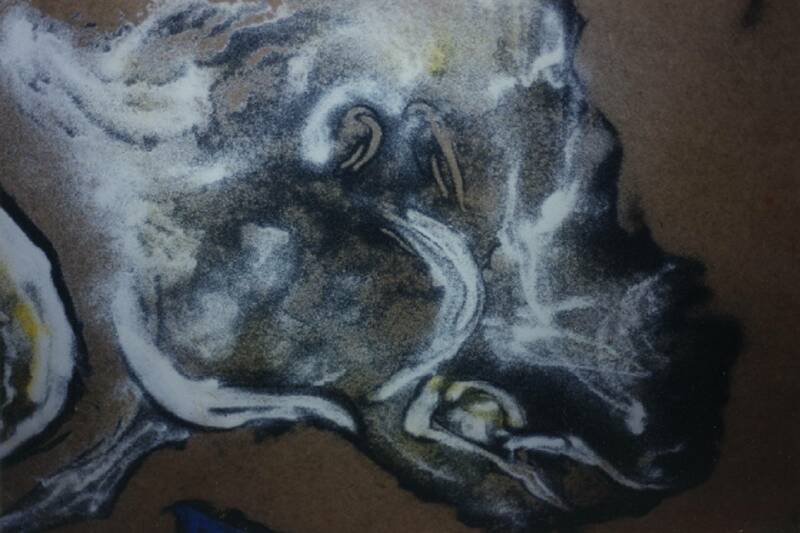 He is our anthropomorphized, animal other, & in the end, it all just falls apart. 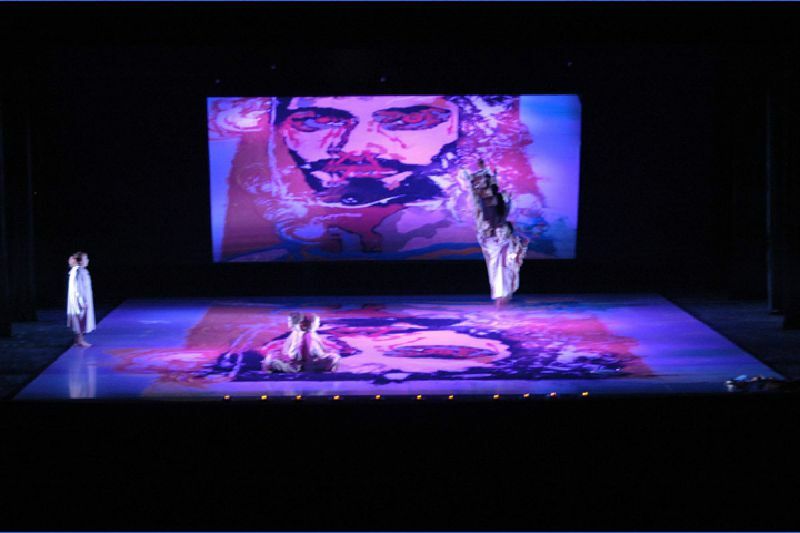 Inspired by the snake rituals, Sarpam Thullal (Kali of the Snakes), she witnessed in Kerala, South India, director / choreographer Clove Galilee conceptualized this creative process as a spiritual ritual. 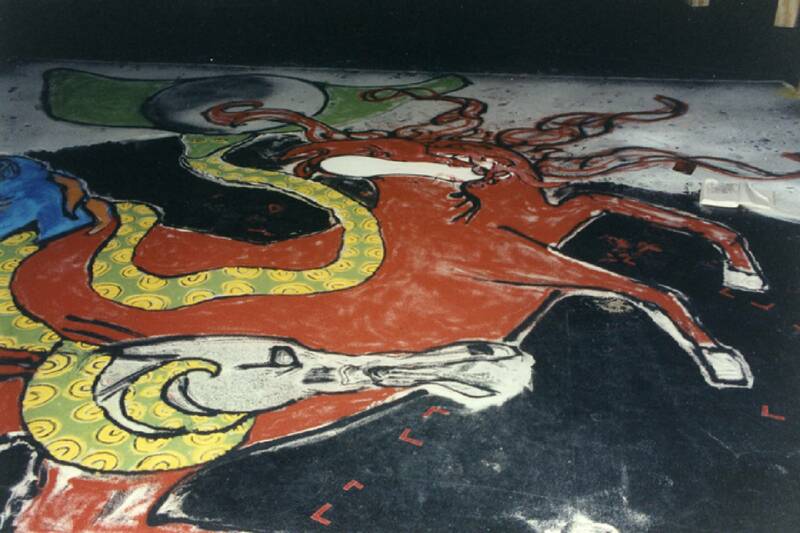 In the Kali ritual, Kali is depicted in a large floor painting made of spices. 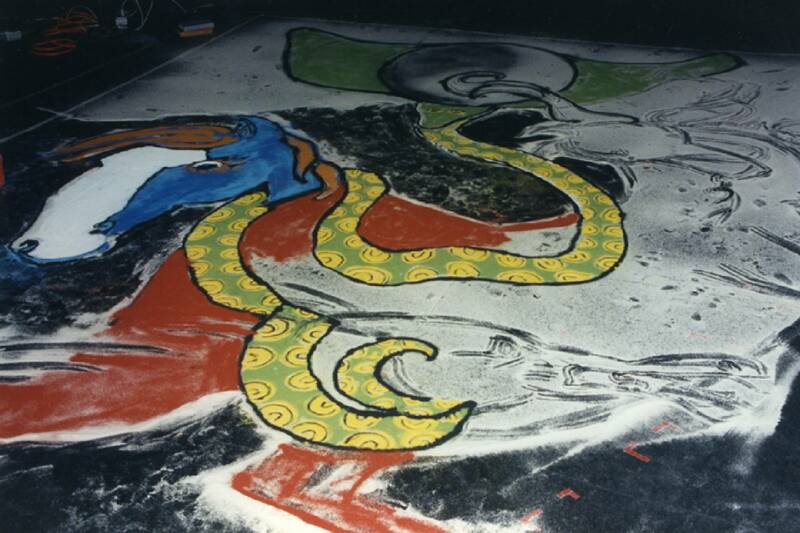 The performer dances on the painting, destroying it as she is spiritually possessed by the deity. At the end of the ritual, the spices are swept away. 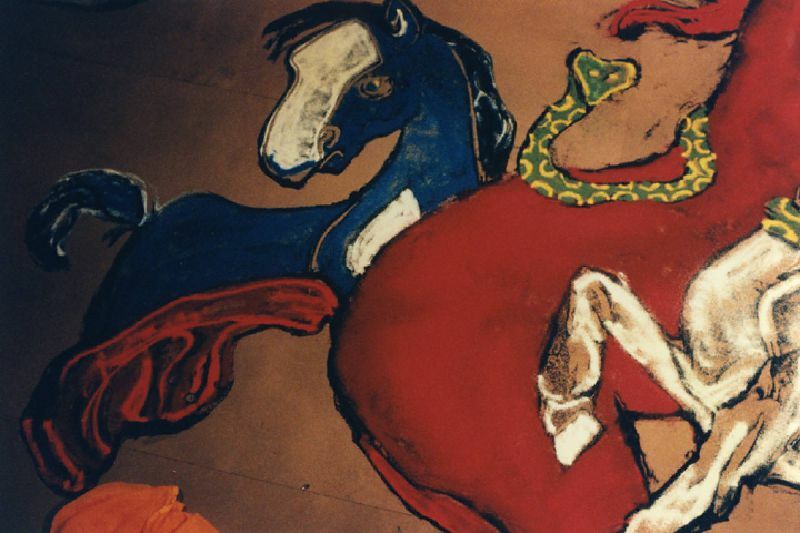 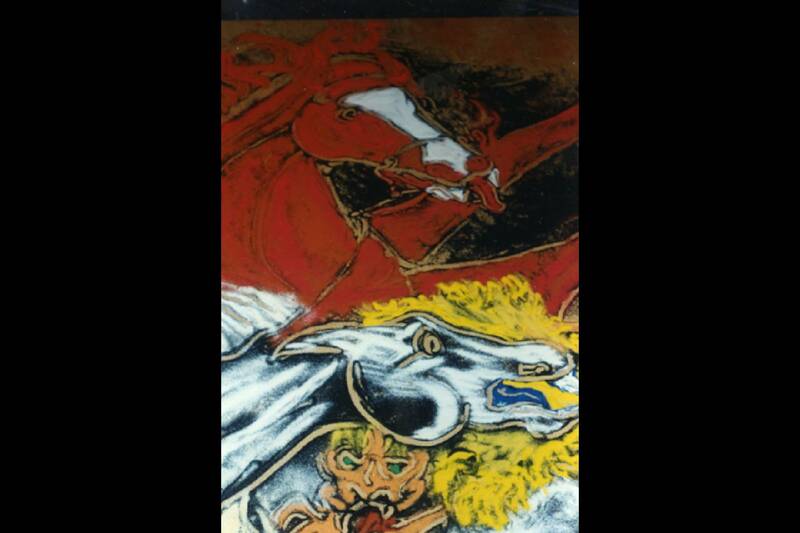 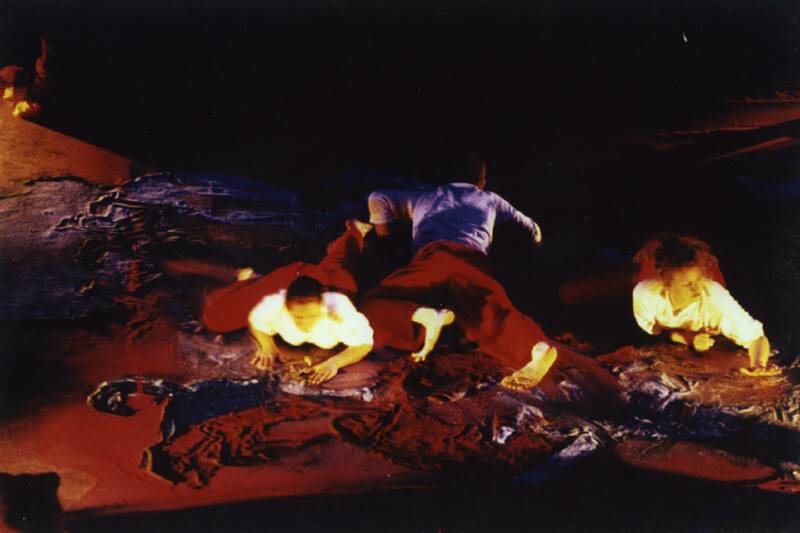 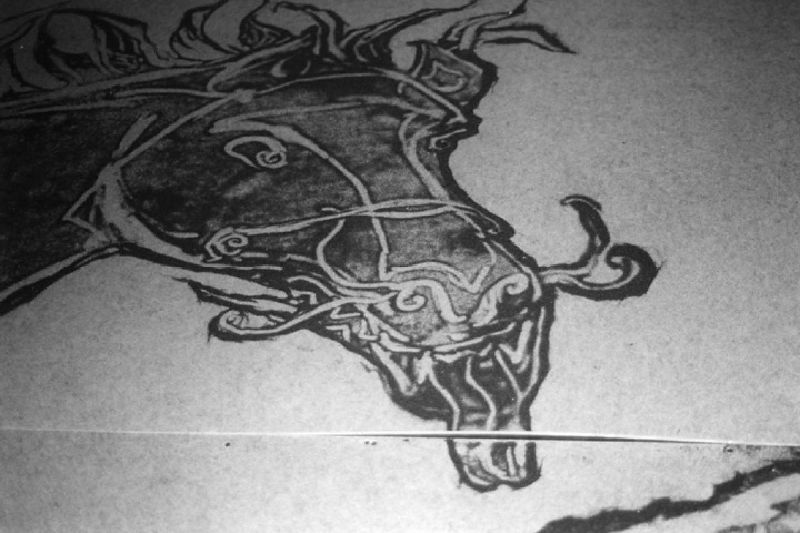 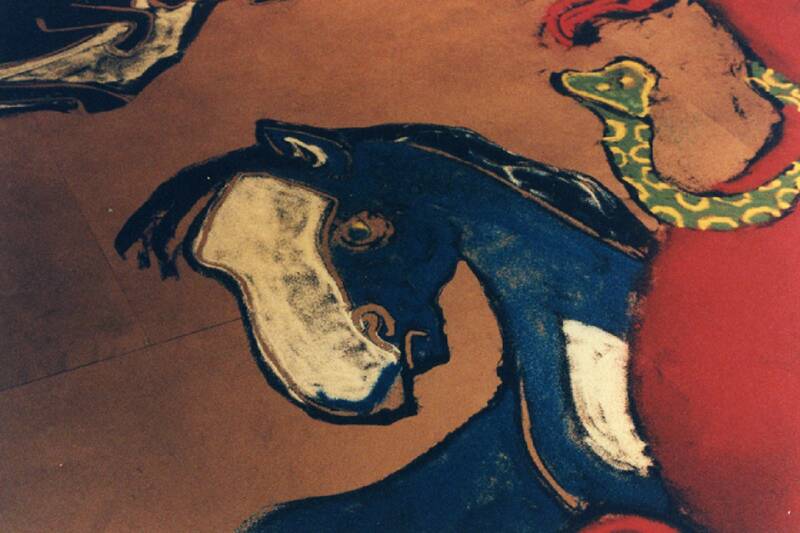 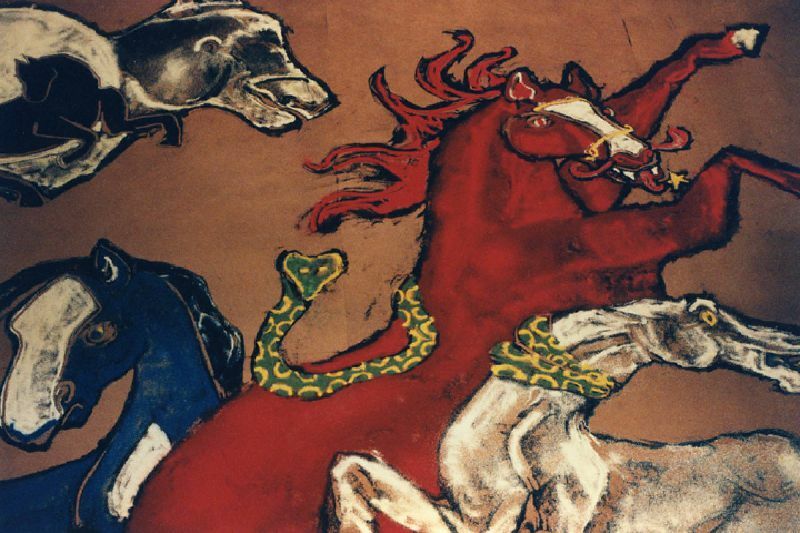 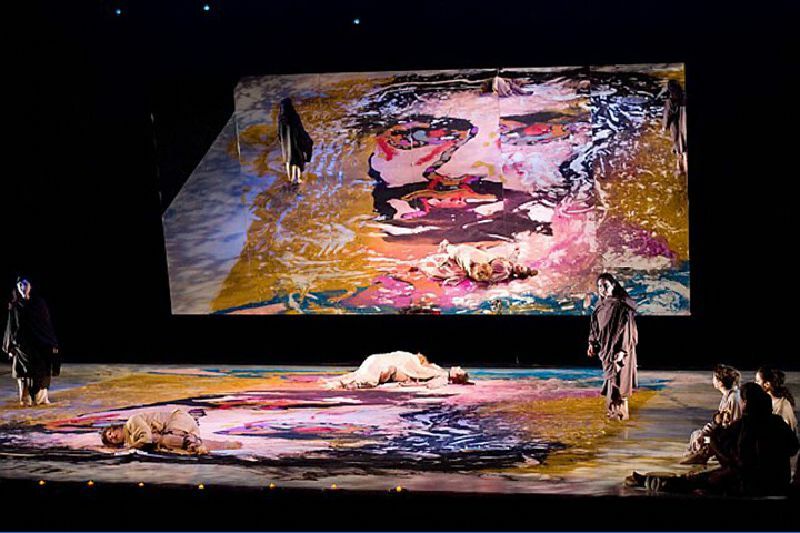 In RED HORSE, the actors performing on a large-scale sand painting, become possessed by the creative spirit embodied by the red horse and destroy the painting. 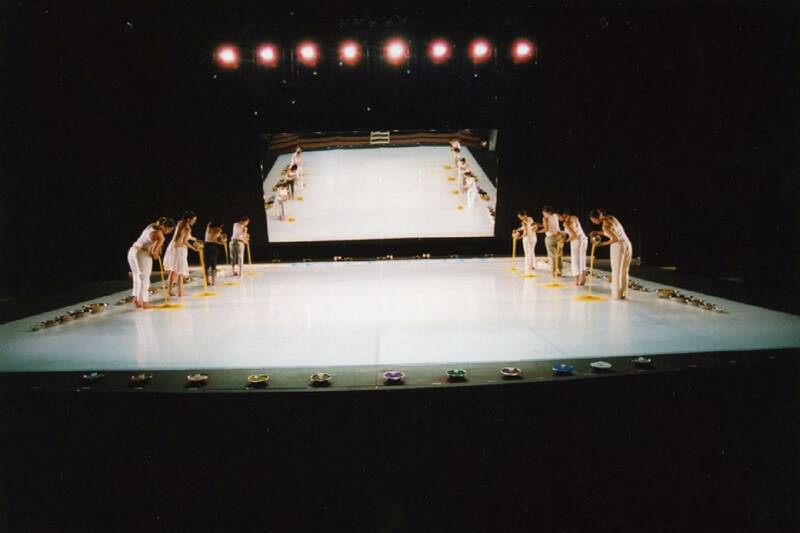 In the end, the stage is swept clean like a blank slate. 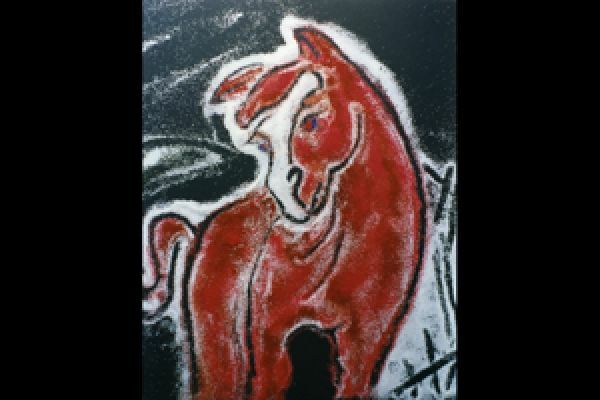 The creative force enters the body in the same way the spirit of a deity enters a human form (or “horse” as spiritual mediums are called in Afro-Cuban & Afro-Haitian religious traditions). 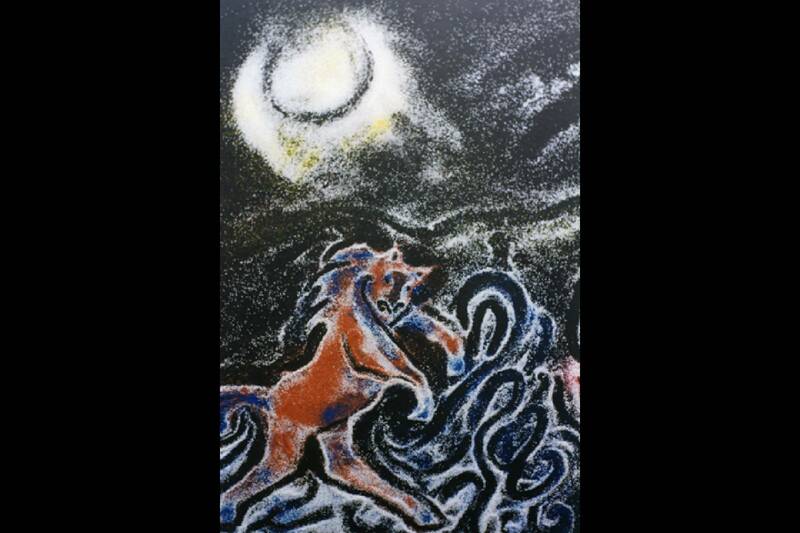 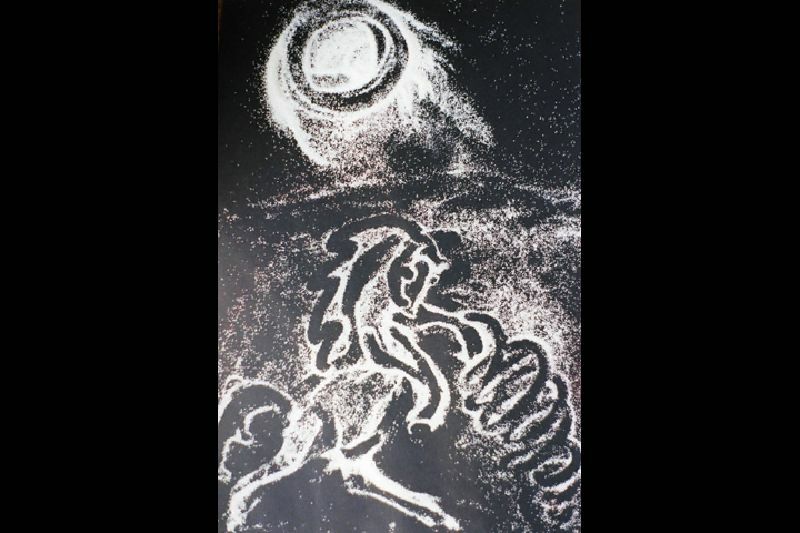 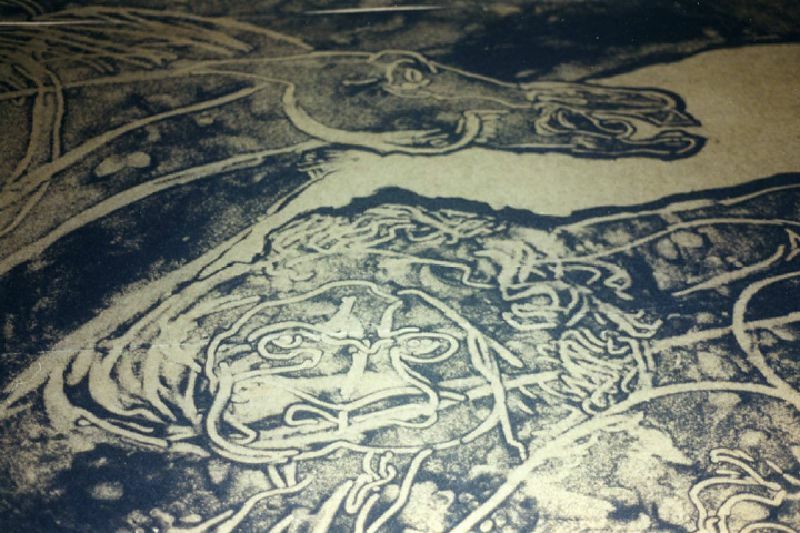 As defined by Maya Deren, “a ritual is an action distinguished from all others in that it seeks the realization of its purpose through the exercise of form.”* My sand paintings also seek to articulate their metaphors through the method of their creation. 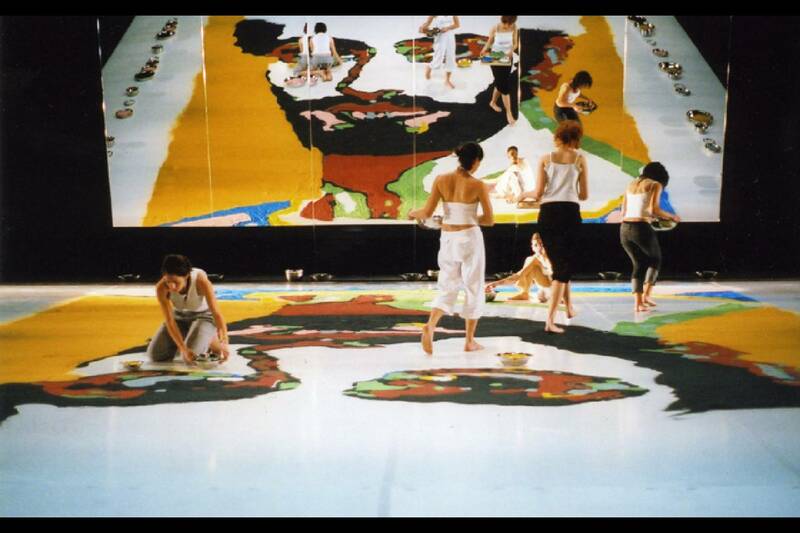 I am interested in the intersection between art making and the performance of community, specifically found in ceremonial sand paintings and veves, or chalk drawings, coming out of the African Diaspora. 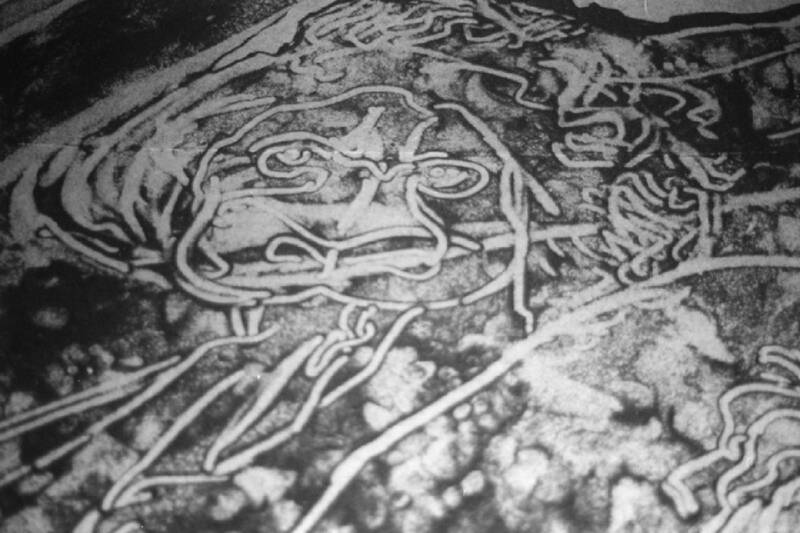 Mark making in the earth has been a sacred art form in numerous cultures where it is used ritualistically to sanctify space with everyday materials such as sand, spice, chalk and blood. Today, sand paintings continue to be used by people as diverse as East Indians, Afro-Cubans, Haitians, Brazilians, Native Americans, specifically the Navajos, Australian Aborigines, Tibetan Monks and on some Christian holy days by Latin Americans. 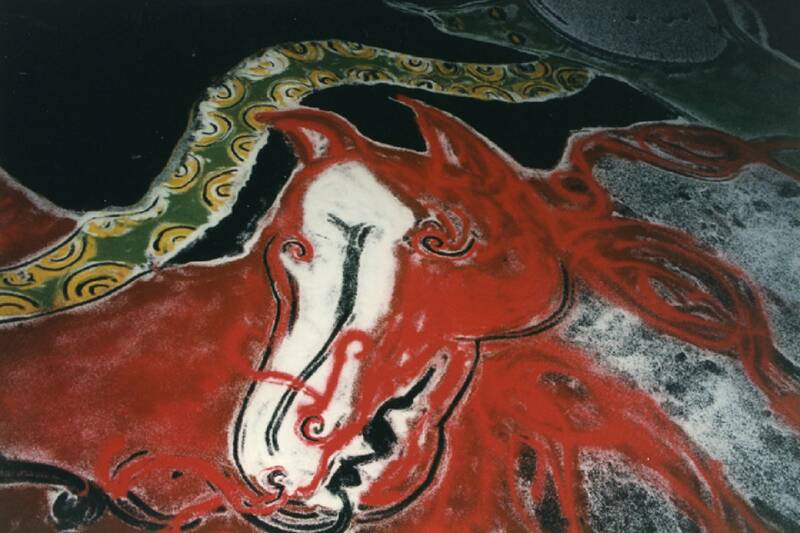 For more on the history of sand painting as an ancient artistic practice follow the link above. The design & dimensions of the sand painting for RED HORSE differed according to each tour venue, ranging in size from 10 x 15 feet to 25 x 40 feet . 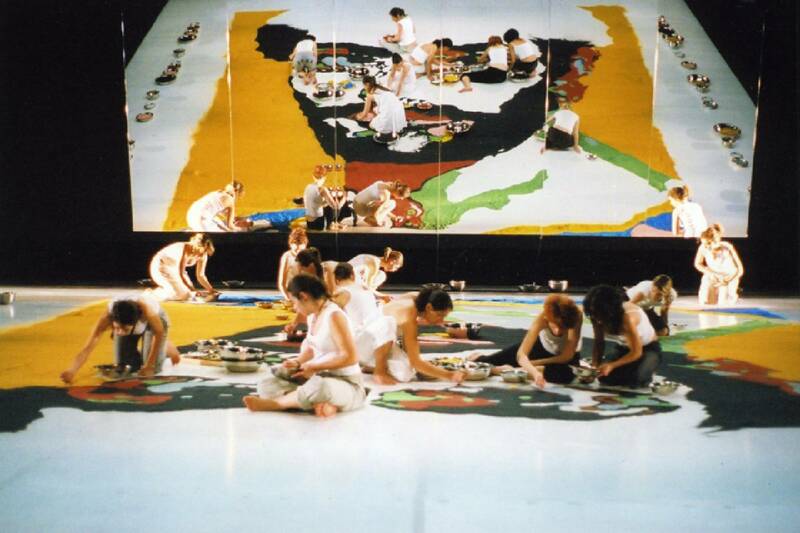 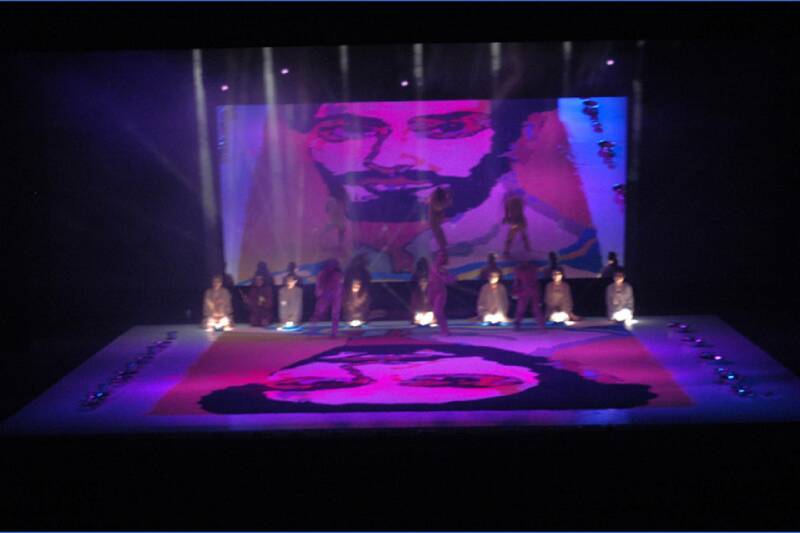 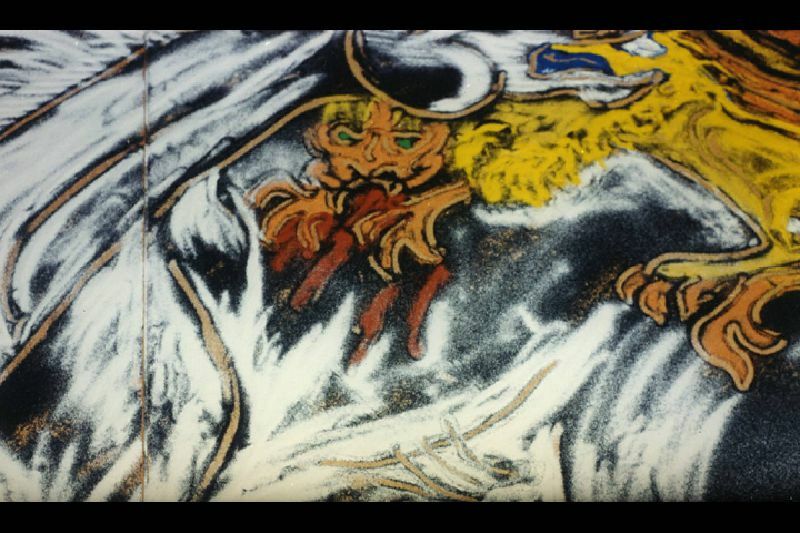 The opening sand painting took Ms. Rogers 10 hours each day to create & was destroyed in the first 5 minutes of the play. The piece was originally developed in residence at the University of California, Santa Cruz, later traveling to New York City and Rio de Janiero, Brazil. 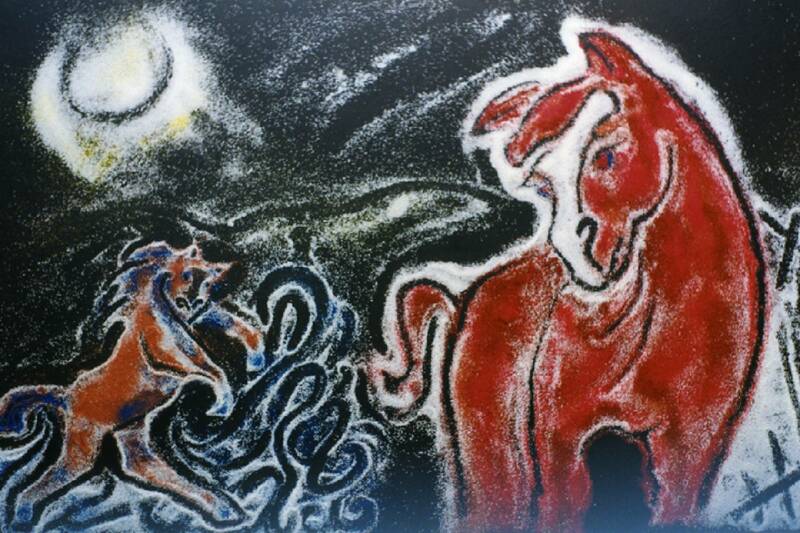 RED HORSE is a reconstruction of The Red Horse Animation, Mabou Mines' first theatrical piece, created in 1970. 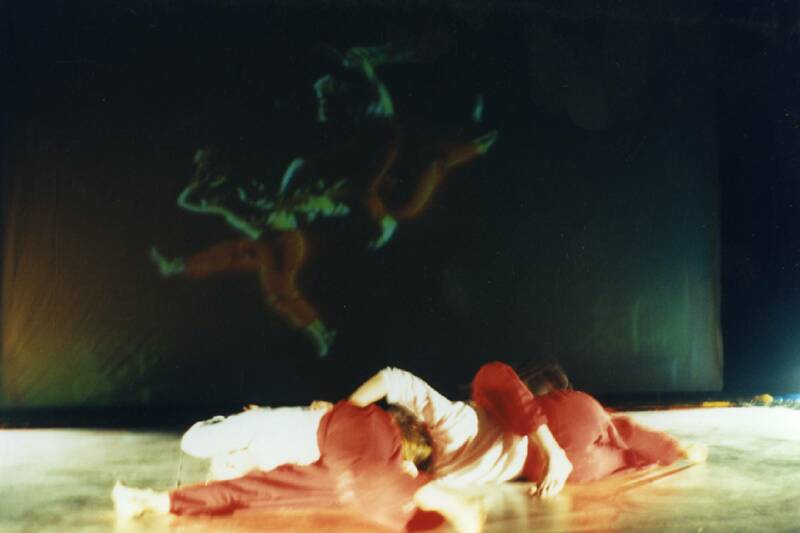 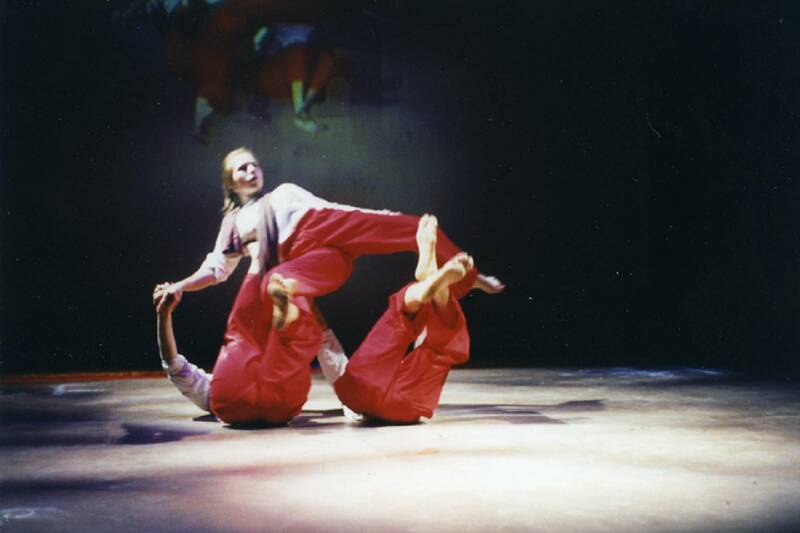 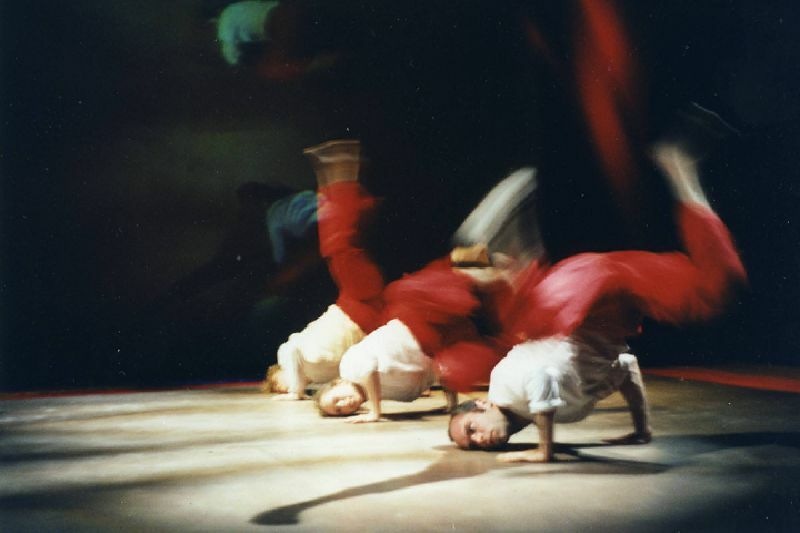 The version described here was resurrected 25 years later as a postmodern dance piece by the 2nd generation of Mabou artists, Clove Galilee (daughter of artistic founders Ruth Maleczech & Lee Breuer) & David Neumann (son of company members Fred Neumann & Honora Fergusson), both of whom performed in the piece. 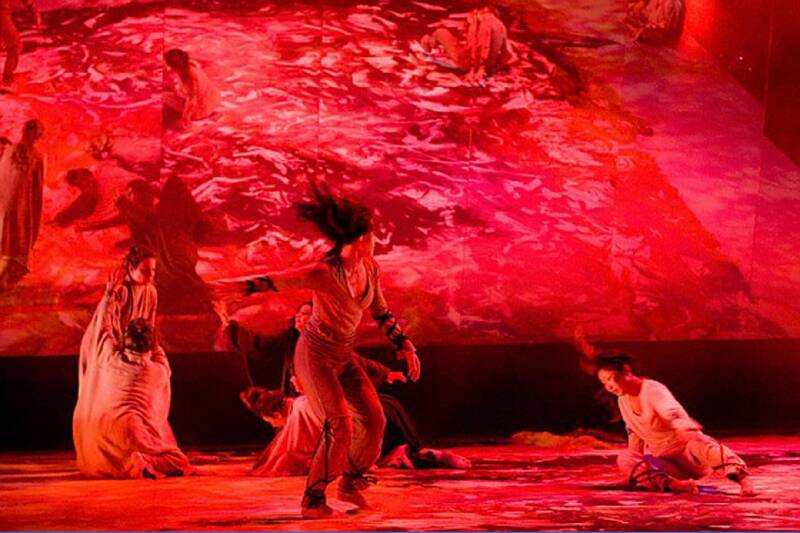 Directed & choreographed by Ms. Galilee with set design and sand painting by Jenny Rogers. 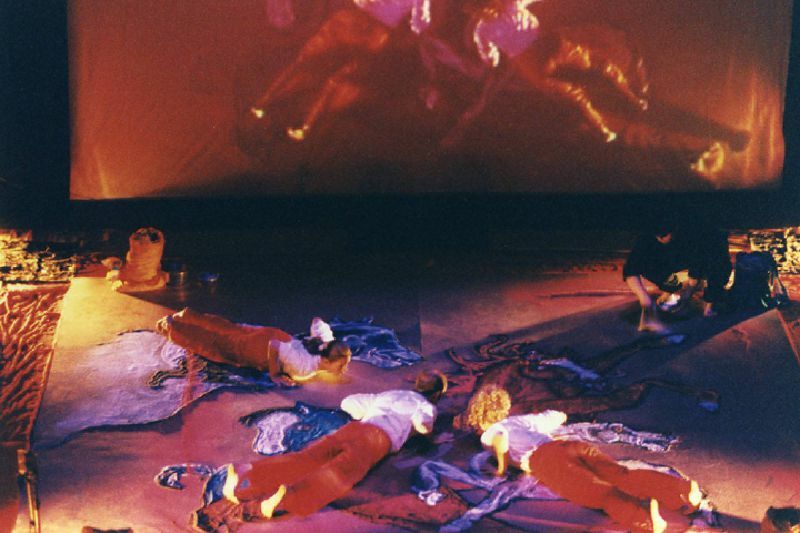 Original theatrical text written by avant garde director / poet Lee Breuer. Mabou Mines is one of the oldest experimental theater companies in the U.S. 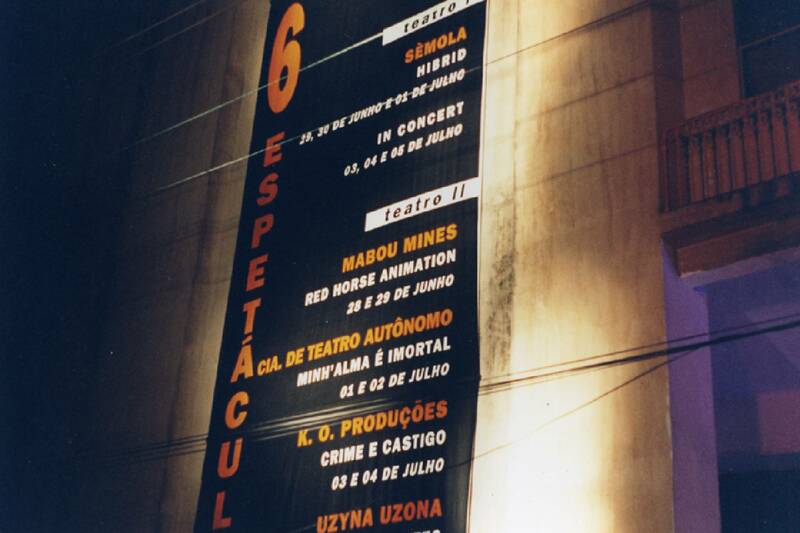 The international tour of the RED HORSE included the Rio Cena Contemporanea Theater Festival in Rio de Janiero, Brazil in 1996. This international theater festival takes place throughout Rio in warehouses, train stations, movie theaters, museums, cultural centers, theaters, cabarets, squares, streets, swimming pools, unusual spaces, in multiple forms as spectacles, performances, debates, seminars, shows, and urban interventions. 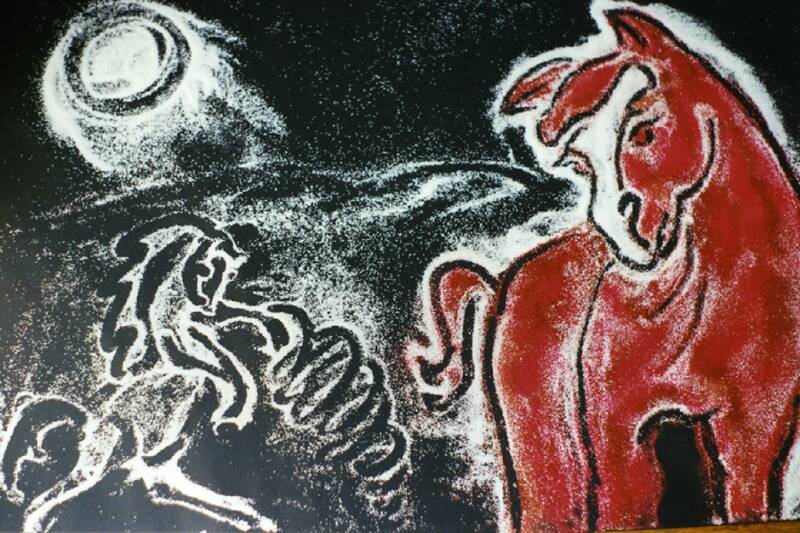 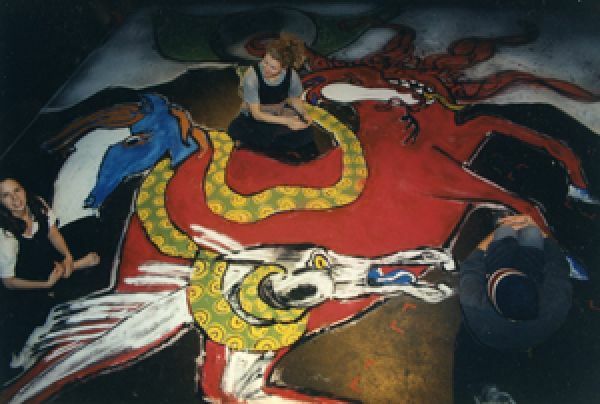 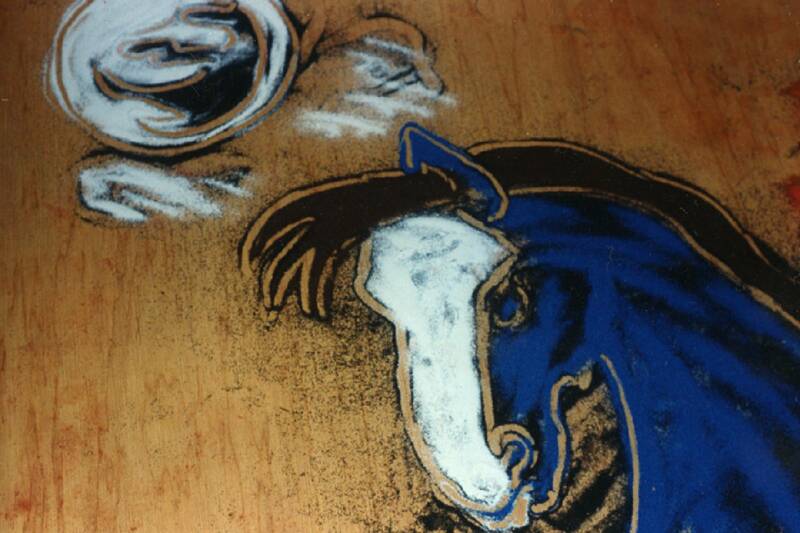 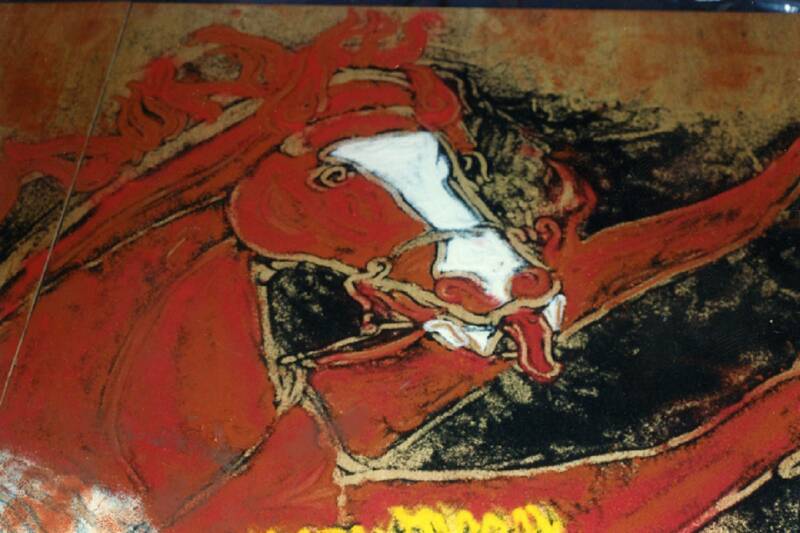 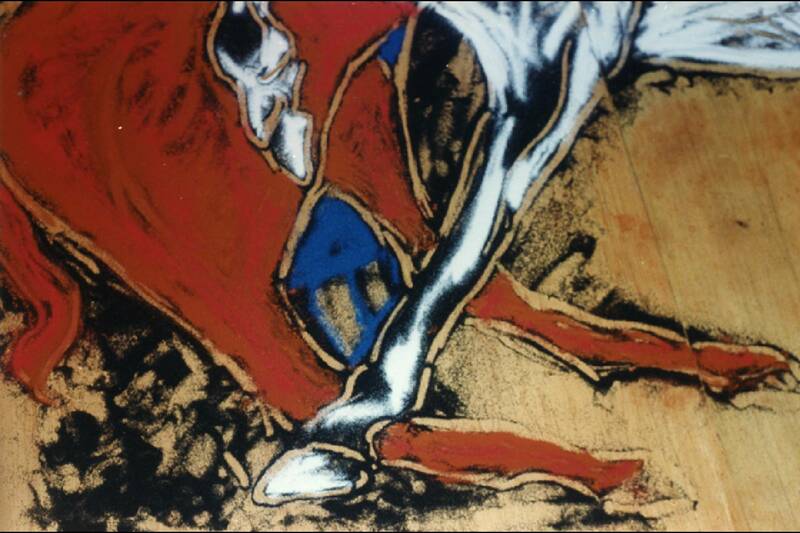 The sand painting for the Brazilian tour of RED HORSE was 25 x 25 feet and took Ms. Rogers 10 hours each day to complete. 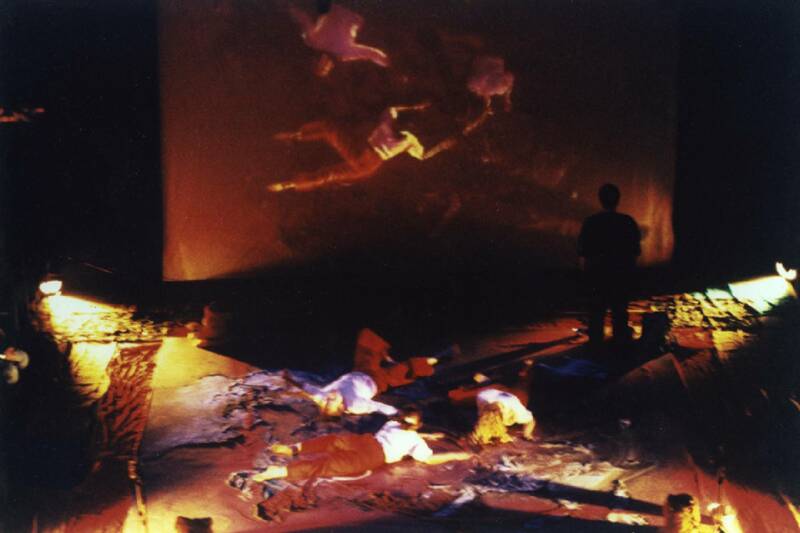 RED HORSE premiered in New York with performances at the HERE Arts Center in 1996. The playing space was extremely limited, forcing Jenny to downsize the full-scale sand painting to accommodate a 10 x 15 foot stage. 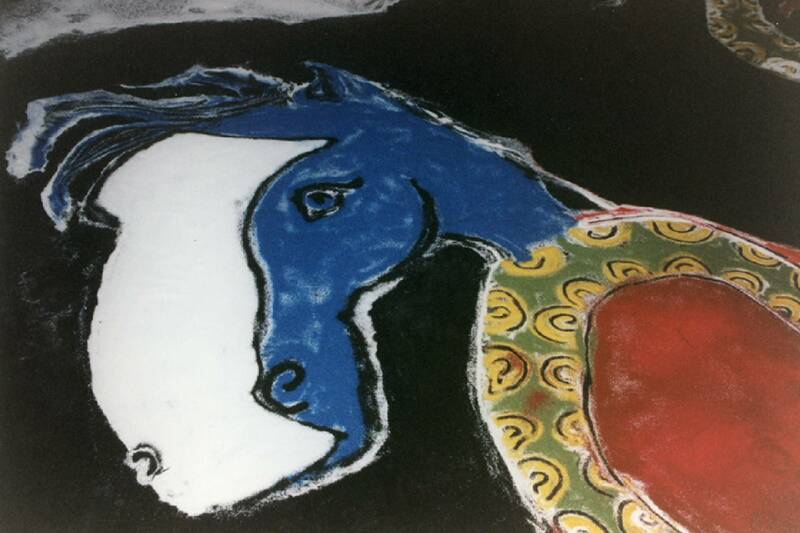 Distinct parts of the original design were abstracted creating one horse with elements of all three previous manifestations—the red Kali demon in the South Indian, kolam-style of the Pullivar community, the blue horse in homage to Thomas Gainsborough’s “The Blue Boy” and Gainsborough, the thoroughbred race horse of the same name, and lastly, the white stallion under attack, (here by a boa constrictor), in the style of the great animal painter George Stubbs, best known for his paintings of horses. 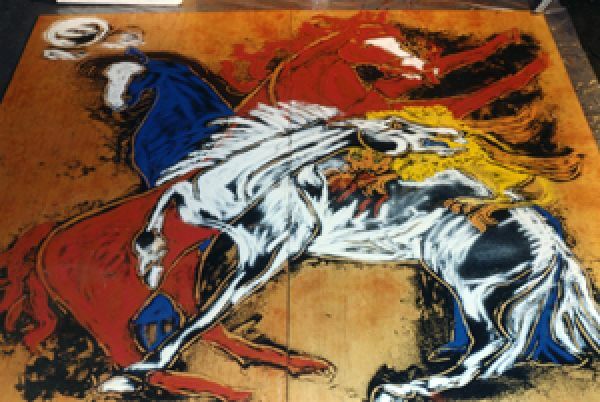 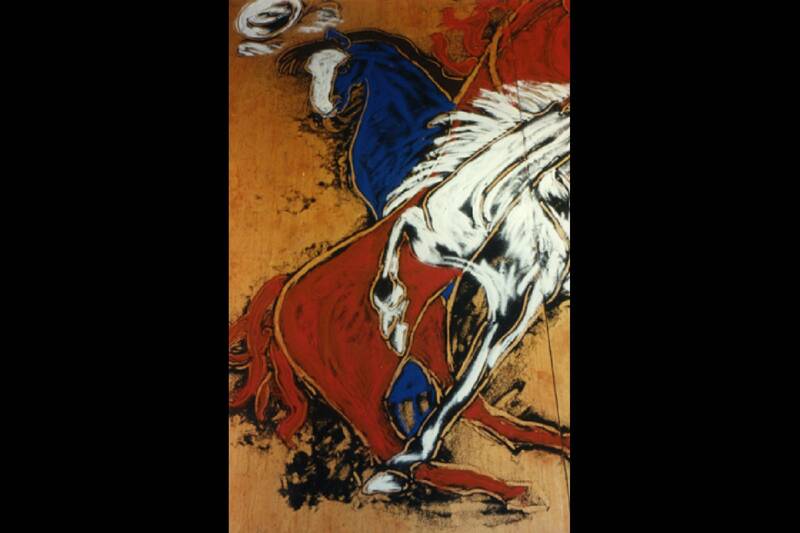 RED HORSE was created through a 6-week residency at the University of California, Santa Cruz. 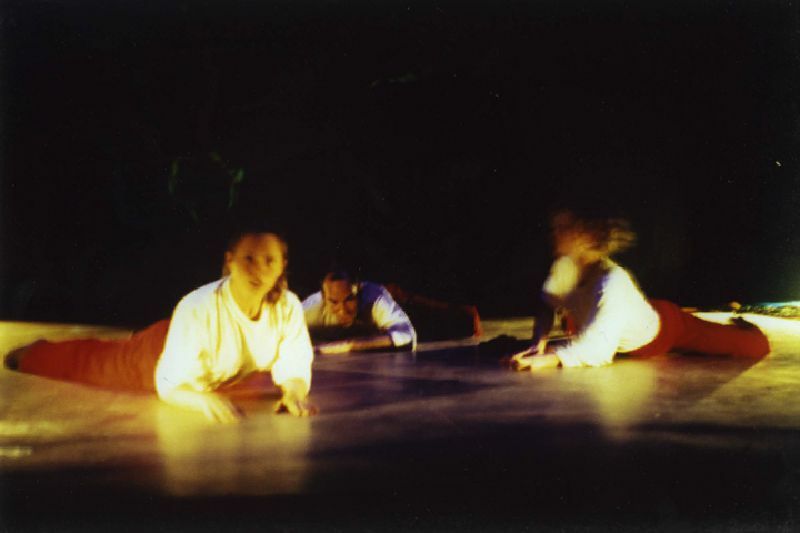 The play was later presented as a “work-in-progress” in a series of performances at the University’s theater center Main Stage. 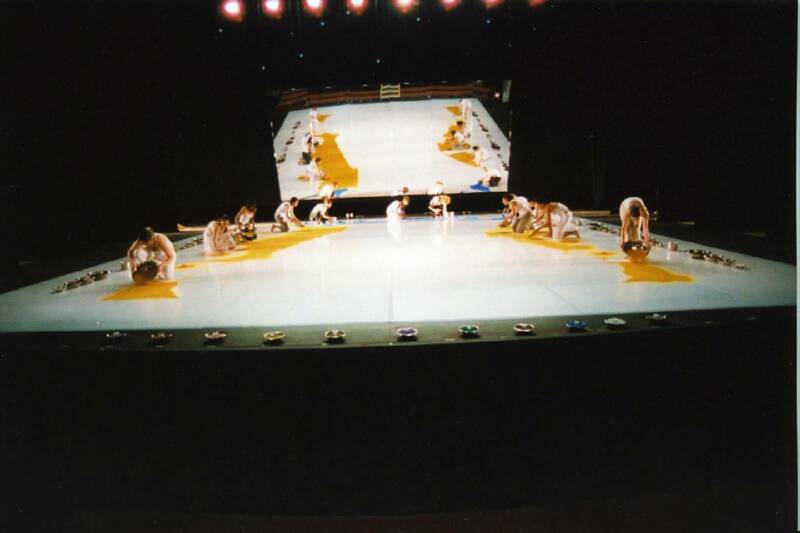 It was in Santa Cruz that elements of the set design, including the elaborate construction of the sand painting were first developed. 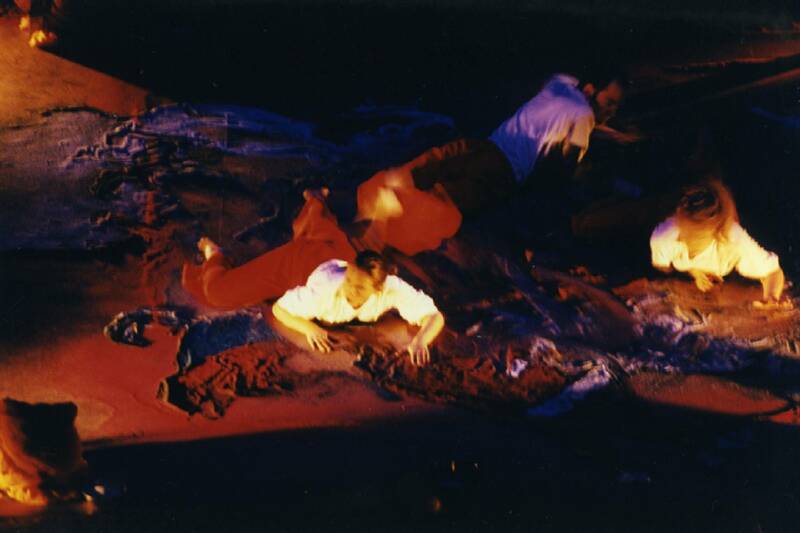 While in residence, Jenny also worked closely with director / choreographer Clove Galilee on the integration of the sand into the choreography of the play and the effects that the sand would have on the dancers' ability to move. 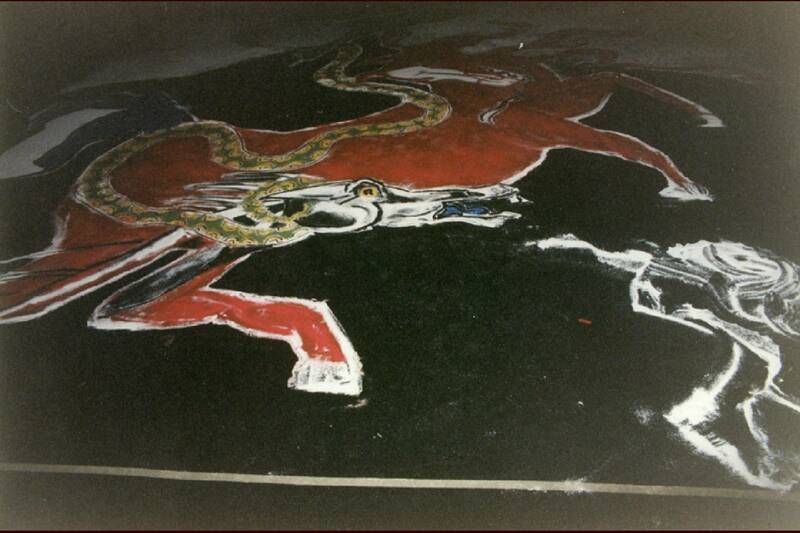 The images above show the first draft of the sand painting completed on two large masonite boards-- 8 x 8 feet in total. 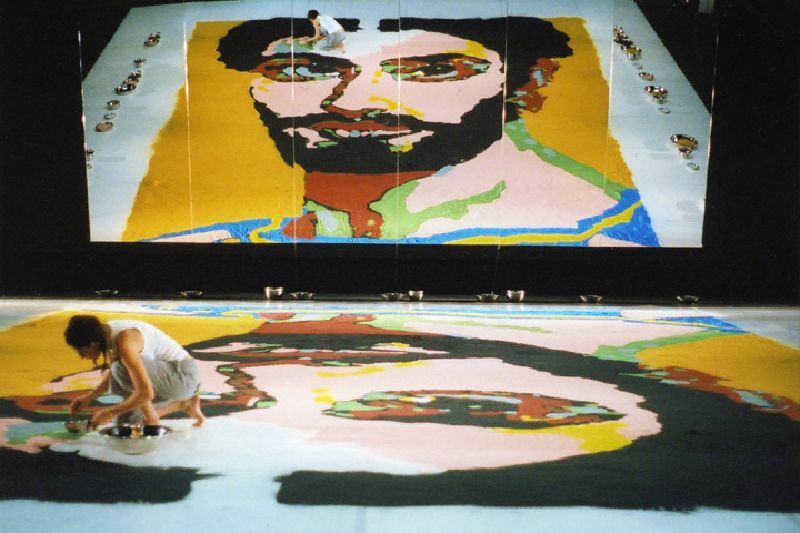 The last 4 images show how the painting would start as an outline in black sand, later transforming for the performance into a large-scale sand painting, 20 x 40 feet. 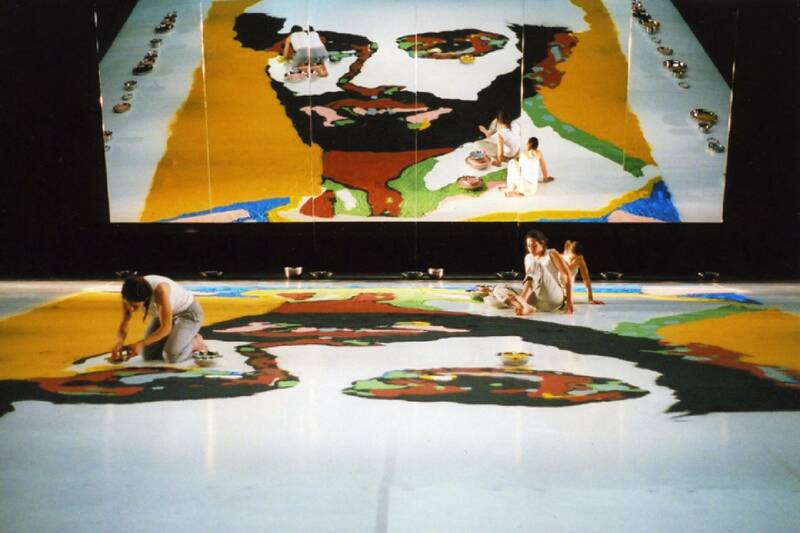 It took 15 hours to complete each day and had to be made each day of performance prior to the show. 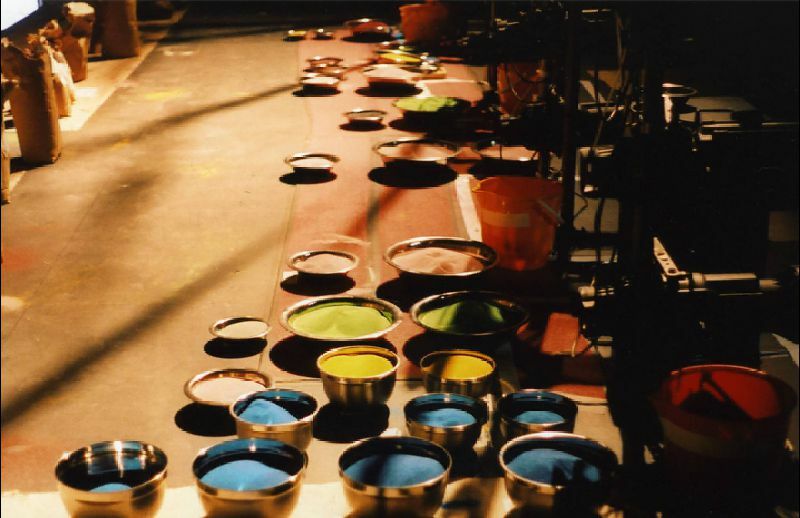 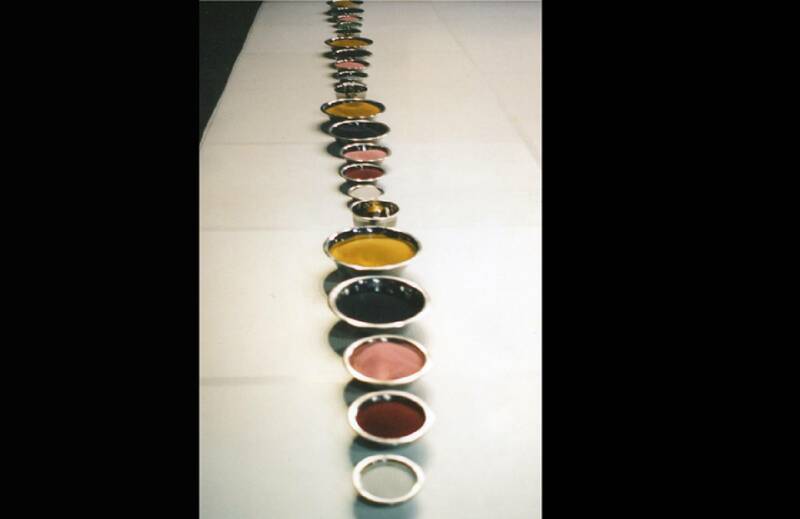 Each sand painting would begin with Jenny scattering the stage in black sand, followed by the meticulous process of her drawing the outline in sand by hand. Color was then added in layers, giving it real depth & dimension, subtle nuances between light and dark- the chiaroscuro- or contrast of a real oil painting. The Little Red Horse is a children’s book about the difficult subject of slavery. Illustrated by sand paintings, an art form indigenous to cultures around the world, specifically those scattered across the African Diaspora, the story follows the adventure of the rebellious Little Red Horse making her escape across the Gobi Desert after the death of her father, Daily Bread.